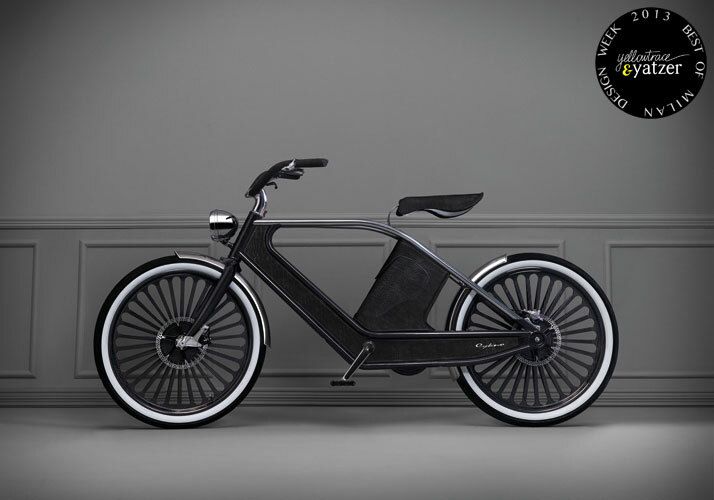 Although the most important annual event on the world design calendar recently closed its doors, the electric buzz it’s left behind can still be felt in the air. Having said that, it could just be me and my ongoing jet-lag! I encountered a fair amount of criticism at this year’s Milan Design Week, largely due to everyone’s continued frustration at the sheer volume of things to see and places to visit. From the sprawling RHO Fiera and its epic 24 halls of Salone Internazionale del Mobile, through to the design events spread far and wide across the entire city in every direction, it continues to be virtually impossible to do and see it all. Despite this challenge, this year I managed to keep up the pace and navigate the city better than ever, although I would have liked to have seen more. If I had to single out a few personal highlights they would include Salone Satellite (the best I’ve seen to date), Ventura Lambrate (my favourite day and an area that keeps going from strength to strength), MOST (a truly spectacular setting and a fantastic event instigated by Tom Dixon) and Moooi's Unexpected Welcome show with its magnificent oversized photography by Erwin Olaf. Zona Tortona and Superstudio remained disappointing for the most part, and I was also somewhat underwhelmed by my usual favorite - Spazio Rosanna Orlandi. 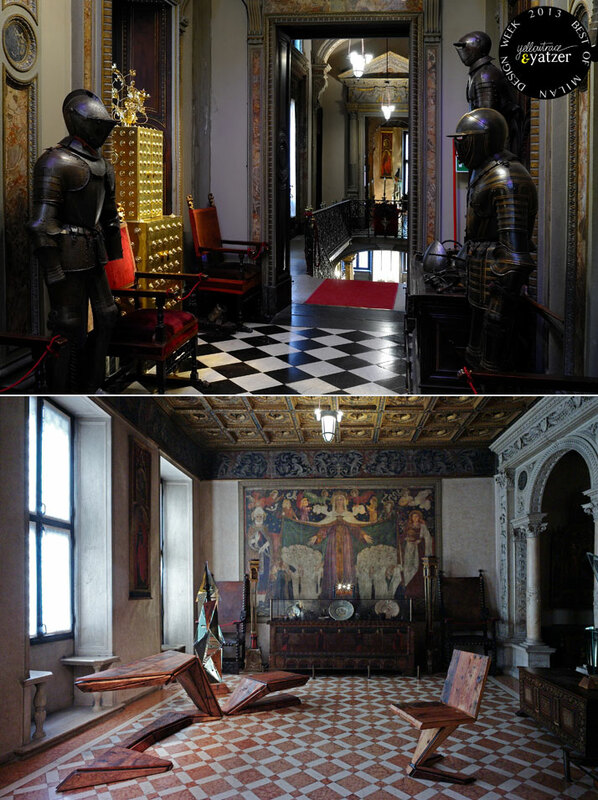 Having said this, Orlandi’s exhibition at the incredible Museo Bagatti Valsecchi definitely made up for this. So without further ado, it has been an absolute privilege to collaborate with Mr. Yatzer, aka Costas Voyatzis who trusted and gave me the honour of becoming his eyes and ears for this year’s Italian design marathon. 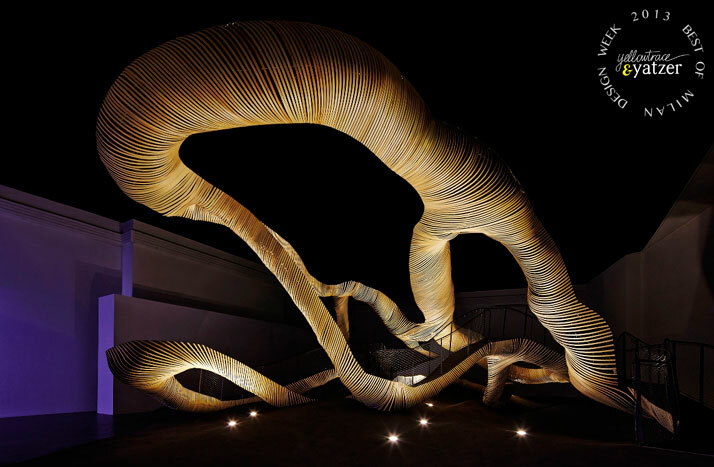 So here’s our hand-picked selection of the best projects and installations from Milan Design Week 2013. The endless scroll down is about to start! 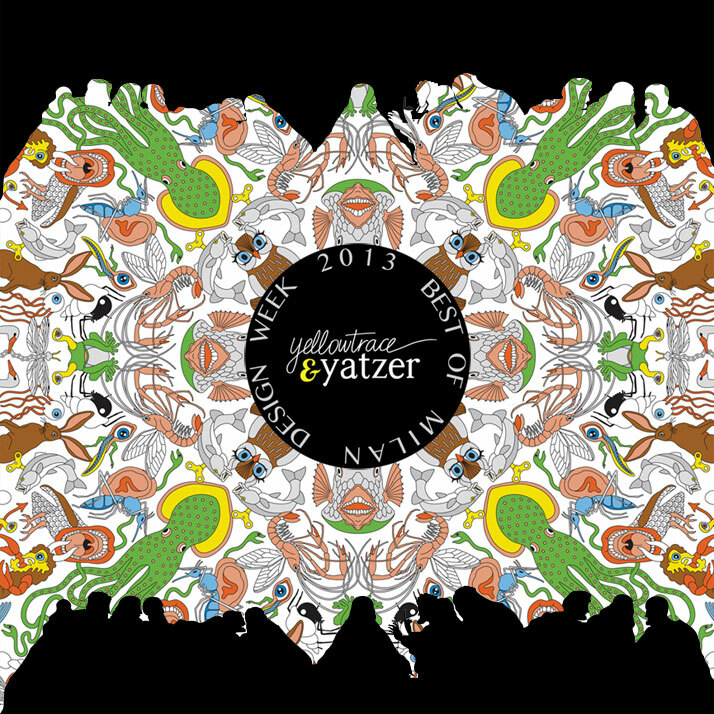 Enjoy it while listening to the latest Yatzerhythms by compilation master Dimitris Papaspyropoulos! Scenography by Studio Job for Lensvelt inside the 18th century Sala Cenacolo at Museum of Science and Technology (MOST). Featured products: Job Buffet, Job Desk, Job Table, Job Desk Lamp, Job Cabinet all designed by Studio Job for Lensvelt . Photo by Ilco Kemmere, © Lensvelt. ''Are you pulling my nose..?!?'' visual communication of the Job Office Desk by Studio Job for Lensvelt. The illustration of Leonardo da Vinci's Last Supper for the 1:13 exhibition at the Frigoriferi Milanesi Gallery in Milan. Therteen designers gave their own interpretation of the thirteen chairs that were never painted in Leonardo's Last Supper on which the Apostles and Jesus sat. A conceptual idea by ''Ghigos ideas''. Two Landlords, Two Ladies and One Unrepeatable Exhibition in Milan. Desk, chair and printer table by Enrico Marone Cinzano. Material iron and wood (Cembro Pine) Lamp 5 Big in glass, metal and wood. Photo by Tatiana Uzlova. 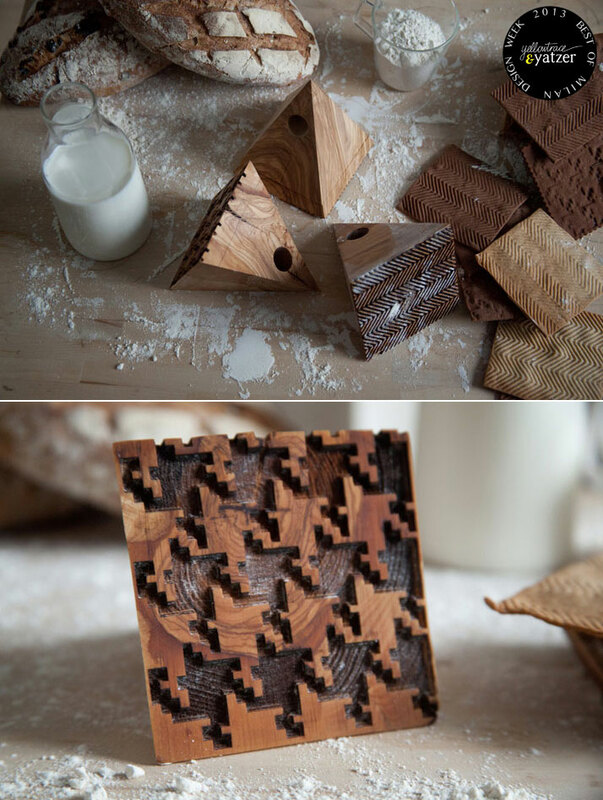 Tessera is a handcrafted line of products built with leather-bound walnut units of 4x4x4cm. Designed by Marc Baroud for CARWAN GALLERY in Beirut, Lebanon. 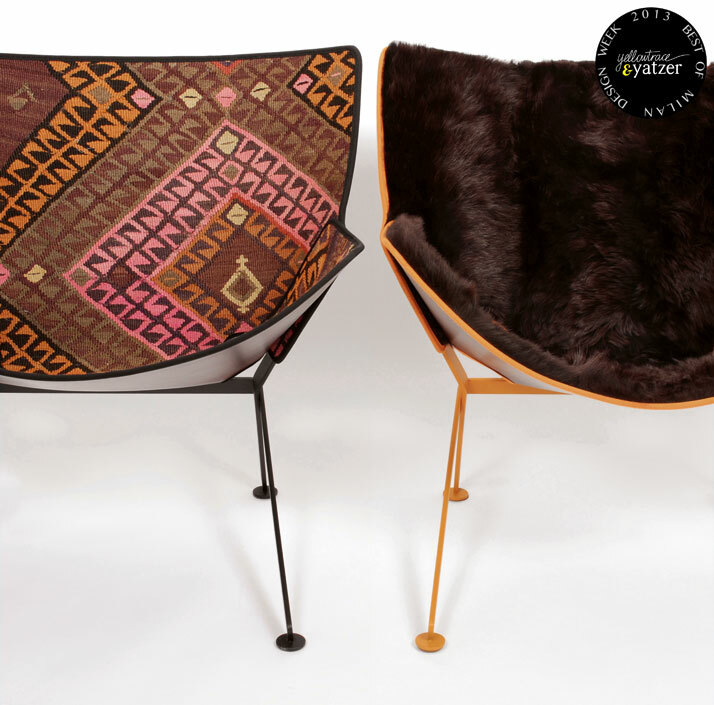 CREDITS > Lounge Chair: limited edition of 10 + 2P Material: Walnut, Leather, and Copper Leatherwork by Johnny Farah. Ottoman: limited edition of 10 + 2P Material: Walnut, Leather, and Copper Leatherwork by Johnny Farah. 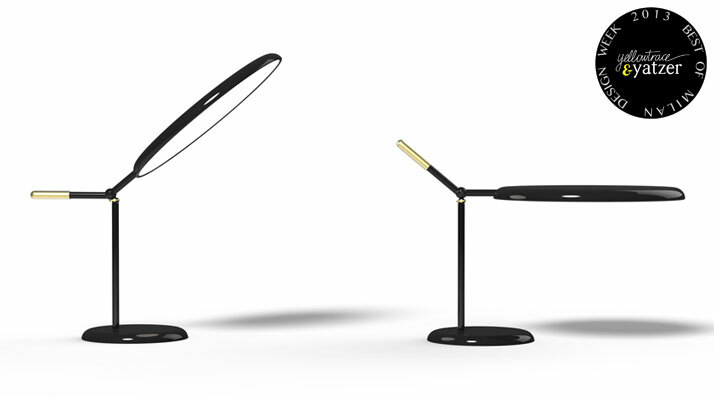 Scintilla LED lamp from the 2013 collection Admit One Gentleman of DANTE, aka Aylin Langreuter and Christophe de la Fontaine. 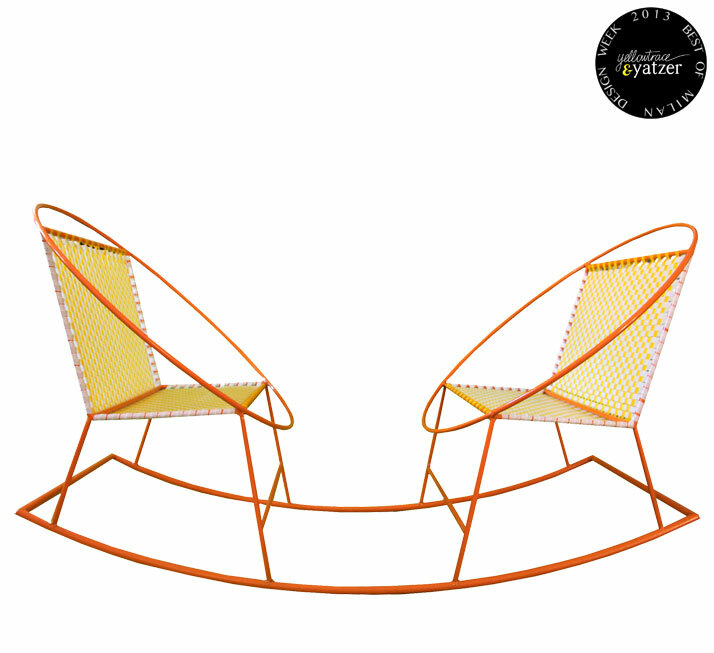 El Santo Libre seat from the 2013 collection Admit One Gentleman of DANTE, aka Aylin Langreuter and Christophe de la Fontaine. 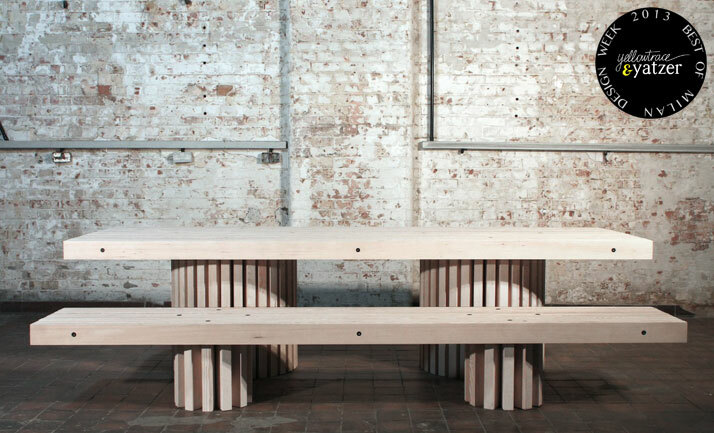 Cowrie Rocker by Brodie Neill for Made in Ratio. Hanging canvas seating by Japanese design studio YOY (Salone Satellite). This collection of two dimensional hanging furniture pieces is made from wood and aluminum frames, covered in stretchy screen-printed fabric depicting different furniture pieces. Photo © Yasuko Furukawa. 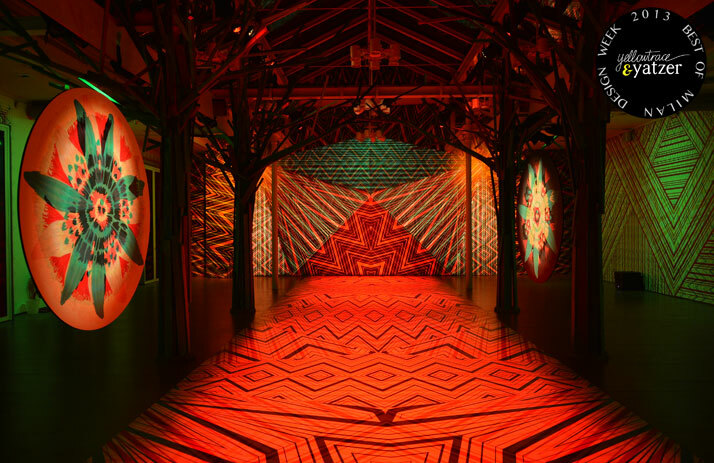 RGB art installation presented by Missoni + Carnovsky at Missoni Showroom in via Solferino 9, Milan. Video filmed and edited by Marco Proserpio and Jacopo Farina. PANORAMI is the first collection of mirror designed by Zaven (Enrica Cavarzan and Marco Zavagno) for Secondome, inspired from the shape of the classic Venetian windows. 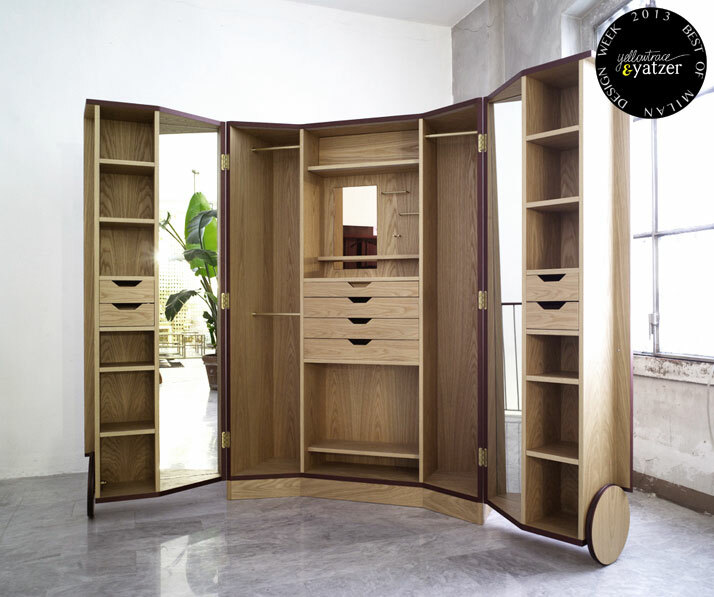 SECRETARIA office cabinet by Nika Zupanc. 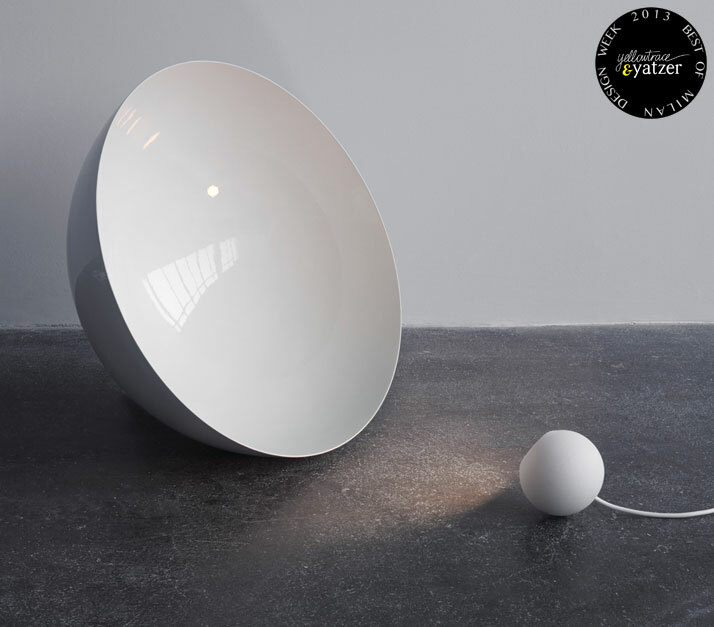 The Full Moon lamp from Collection III by Nika Zupanc for Sé. Bardi’s Bowl Chair which was designed by Italo-Brazilian architect Bo Bardi in 1951 has been reissued by Arper in a limited edition of 500 pieces. 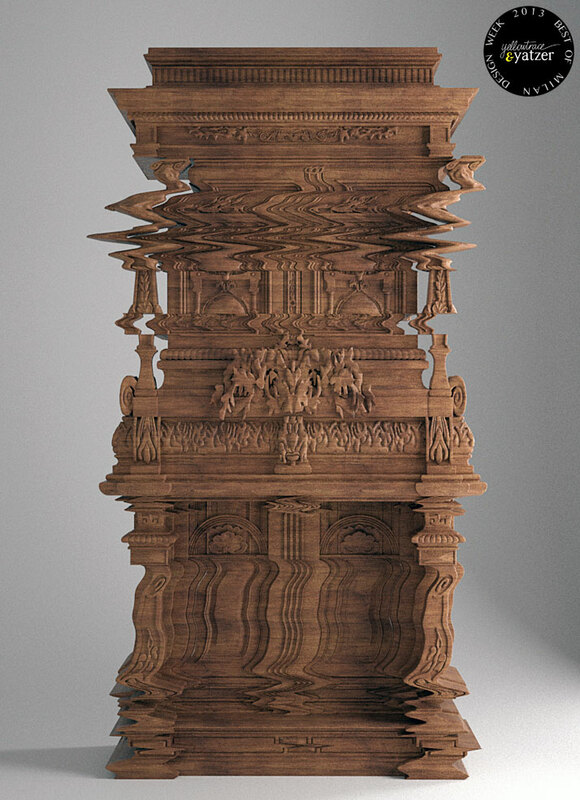 The ''Good Vibrations'' storage unit by Ferruccio Laviani for Fratelli Boffi. Design wooden headwear by Andrea Deppieri for Tête de bois. 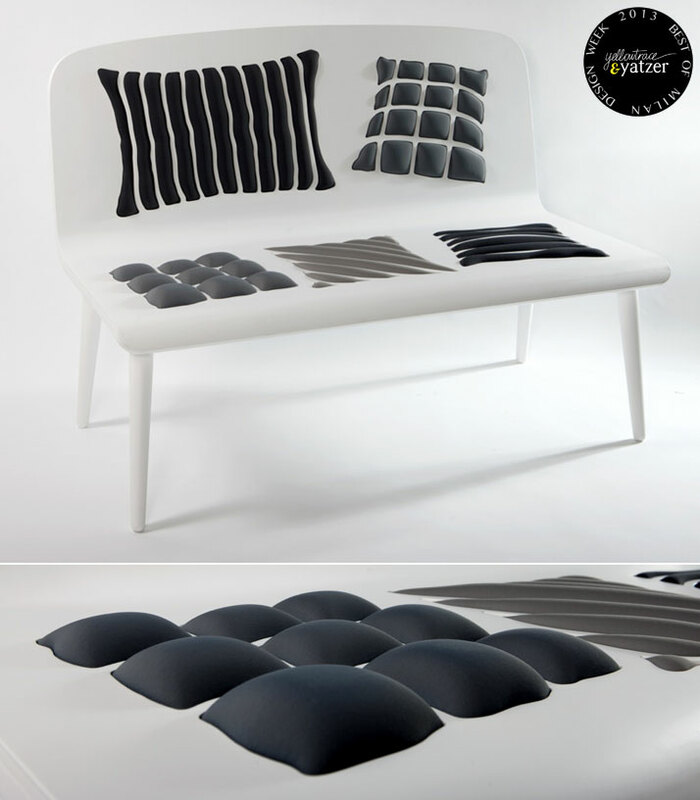 The ''slat'' collection from Philippe Malouin's first solo exhibition in Milan under the title 'Simple'. Curated by Maria Cristina Didero for PROJECTB Gallery in Milan. On view till the 16th of May 2013. 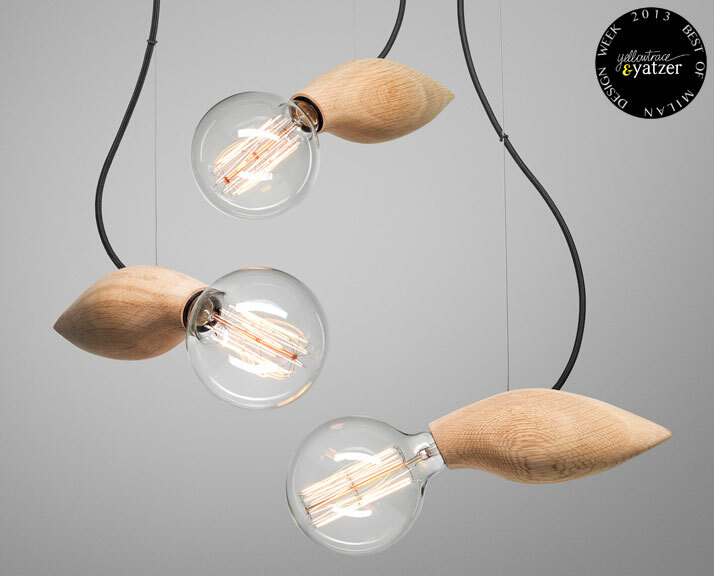 Globe lights by Studio Vit. (Salone Satellite). Photo by Annabel Elston. © studio vit 2013. Pythagoras Chair designed by Sander Mulder. Photo © Diewke v/d Heuvel, Sander Mulder. Handmade rocking chairs by Mecedorama. (Salone Satellite). OJENTAA sculptural floor light by Mari Isopahkala. (Salone Satellite). 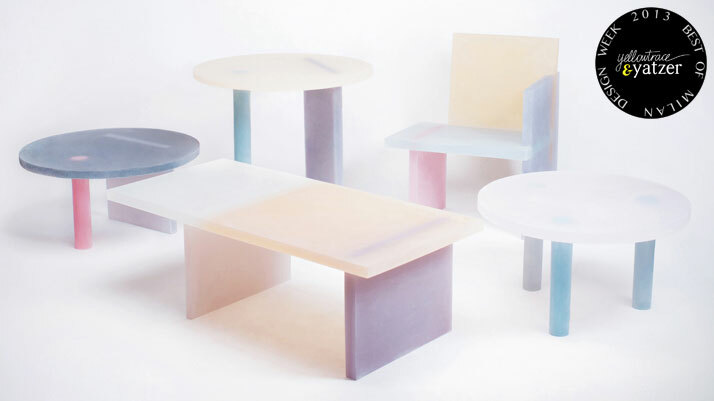 Haze series resin furniture by Wonmin Park. 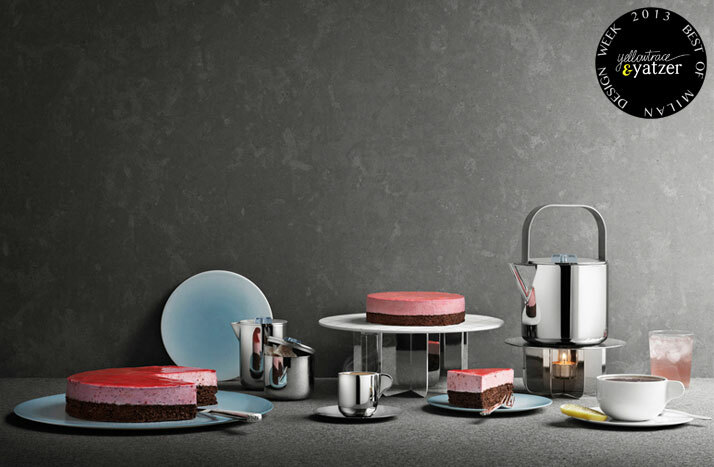 At the invitation of Georg Jensen, Scholten & Baijings designed a Tea & Cake collection entitled 'Tea with Georg'. The title is a nod to the company’s Danish founder, Georg Jensen. 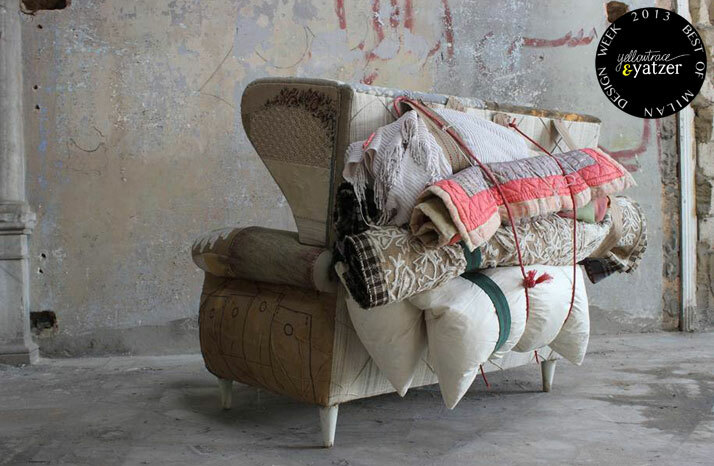 The collection was launched at Spazio Rossana Orlandi. The white tiles (The Storywall) of the Analogia Project by Andrea Mancuso and Emilia Serra in collaboration with master ceramist Alessio Sarri. (Ventura Lambrate). Photo by Giulio Boem. 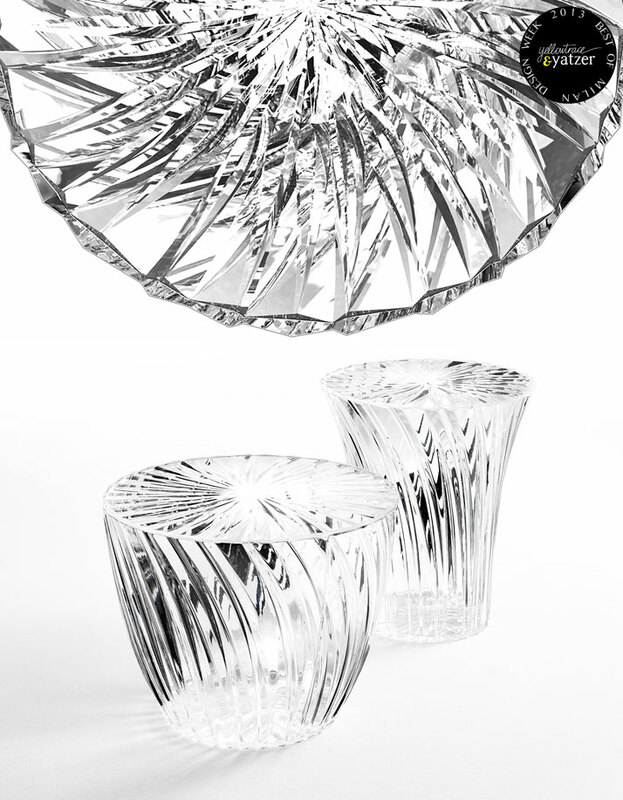 SPARKLE stool and side table by Tokujin Yoshioka for Kartell. 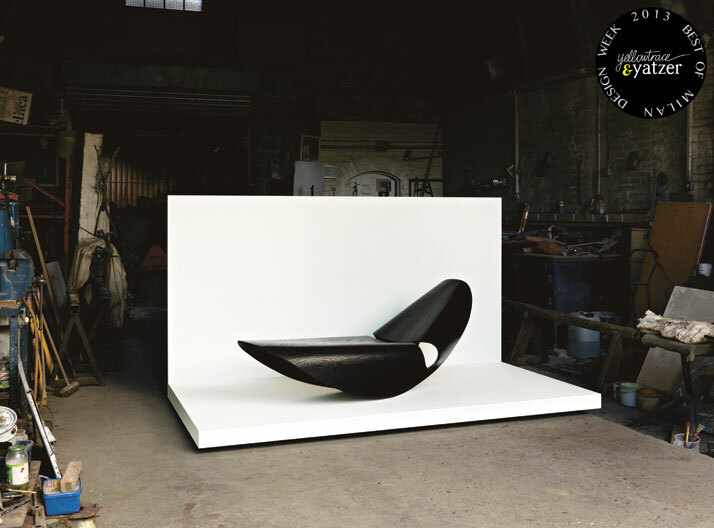 'Just Black' collection (designers: Claesson Koivisto Rune, James Irvine, Jasper Morrison, Konstantin Grcic, Maddalena Casadei, Naoto Fukasawa, Ross Lovegrove, Thomas Sandell) for Marsotto Edizioni. 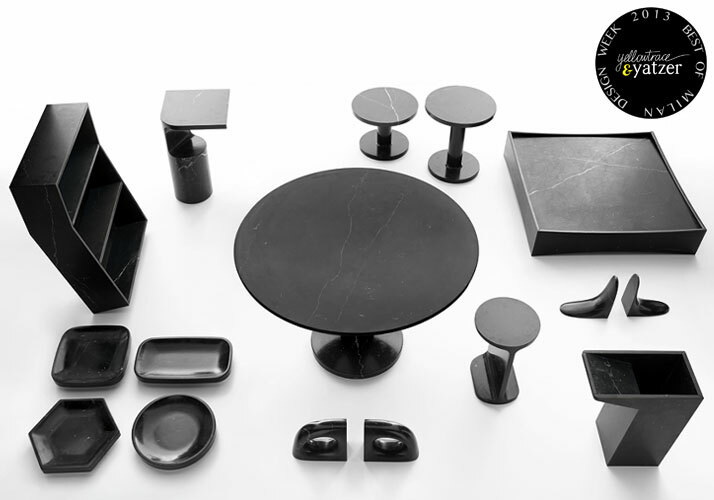 This collection, usually made from white carrara marble, was reissued in "Nero Marquinia", aka black marble, giving the pieces a more mysterious, sharper edge. Photo © Miro Zagnoli. 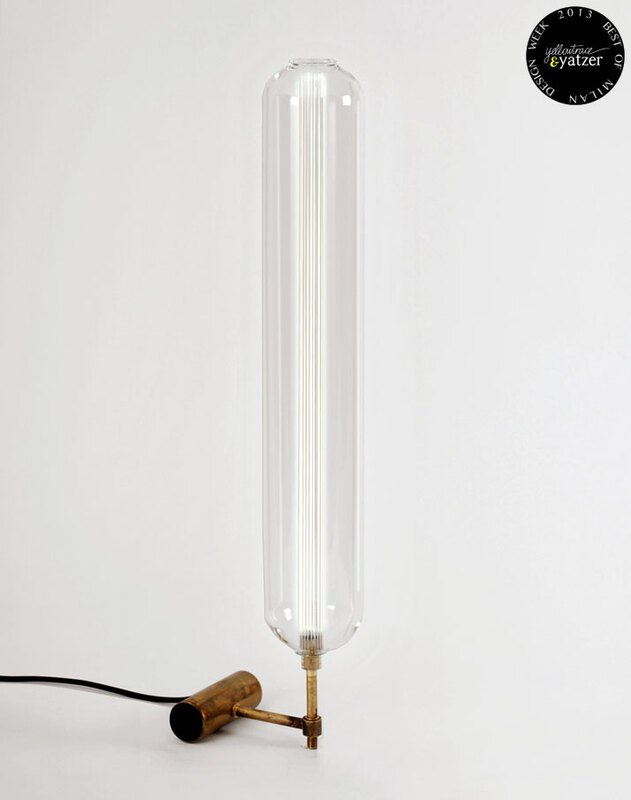 Toto floorlamp by Veronika Wildgruber. (Salone Satellite). 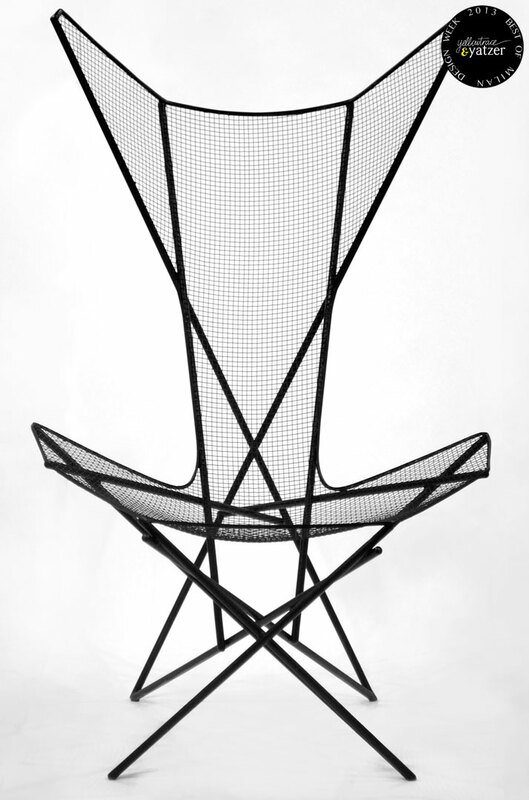 Linee chair by Taewoo Kim. (Salone Satellite). 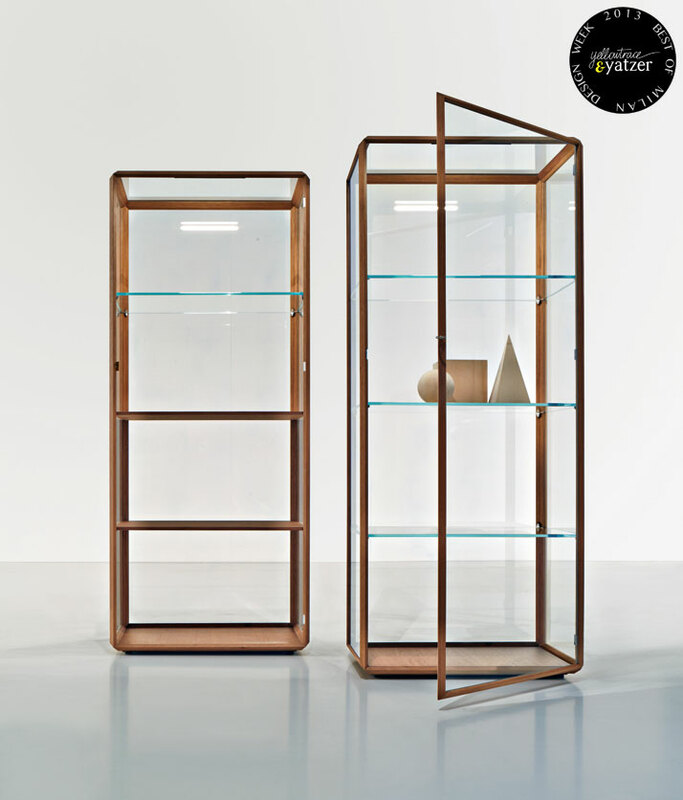 45°/vetrina cabinet by Ron Gilad for Molteni. 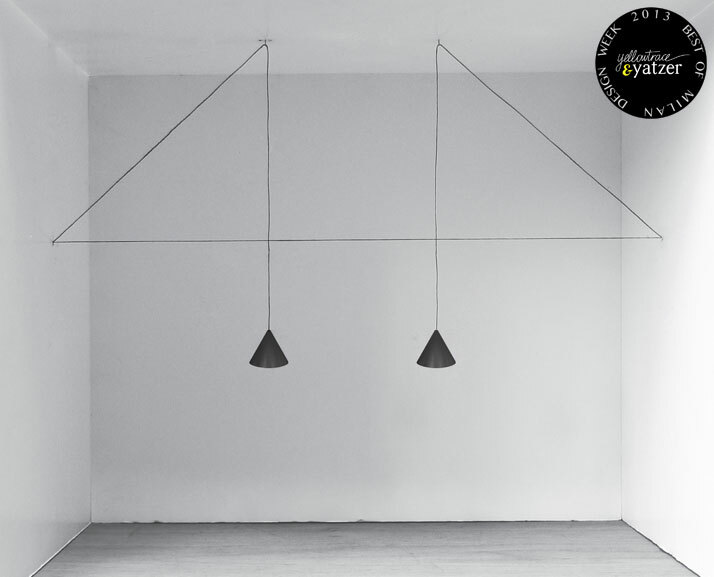 String Light by Michael Anastassiades for Flos. 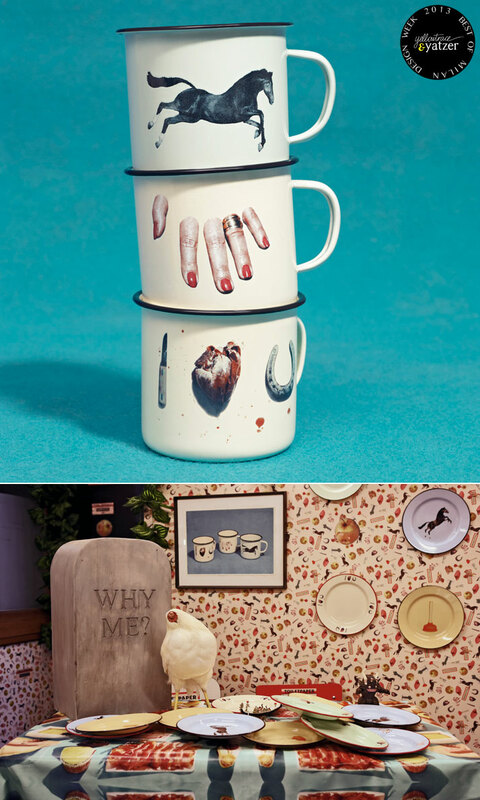 A new tableware collection by Seletti in collaboration with Maurizio Cattelan and Pierpaolo Ferrari, the founders of TOILETPAPER magazine. 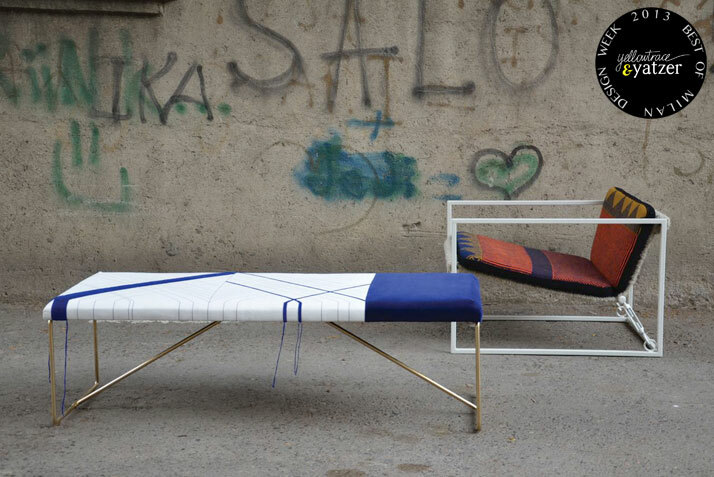 Embroider Blue bench and Knitted Armchair by Rooms. 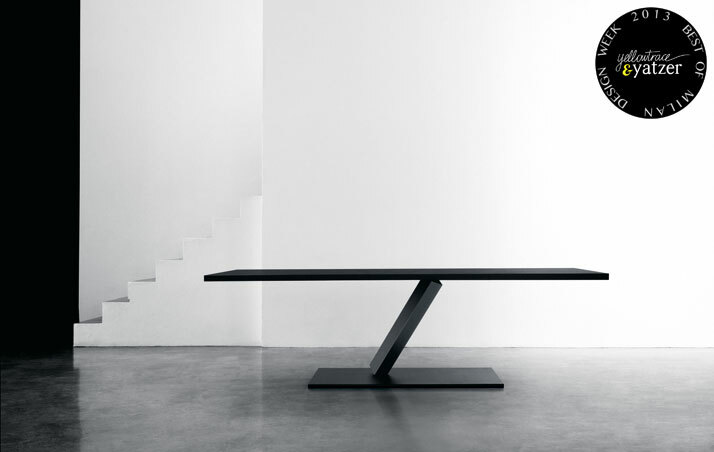 Element table by Tokuyin Yoshioka for Desalto. Libreria Voliera metal shelving by Pietro Russo. 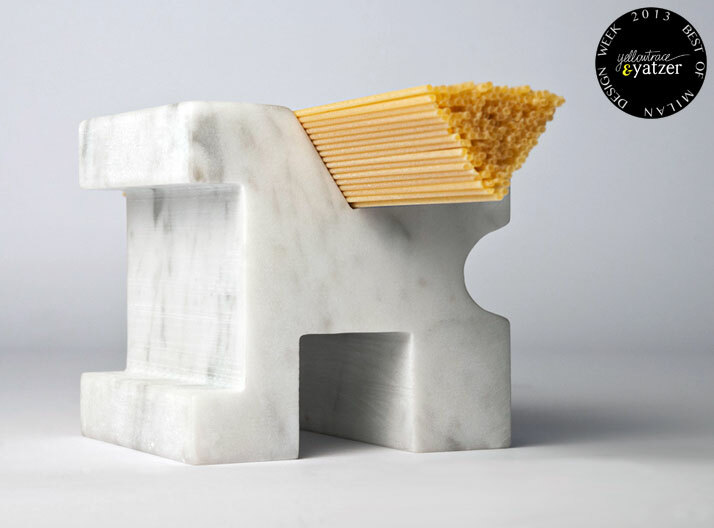 Carattere tipografico, a kitchen ‘body type’ made from single piece of marble for measuring correct amount of spaghetti. Designed by Studio Lievito. 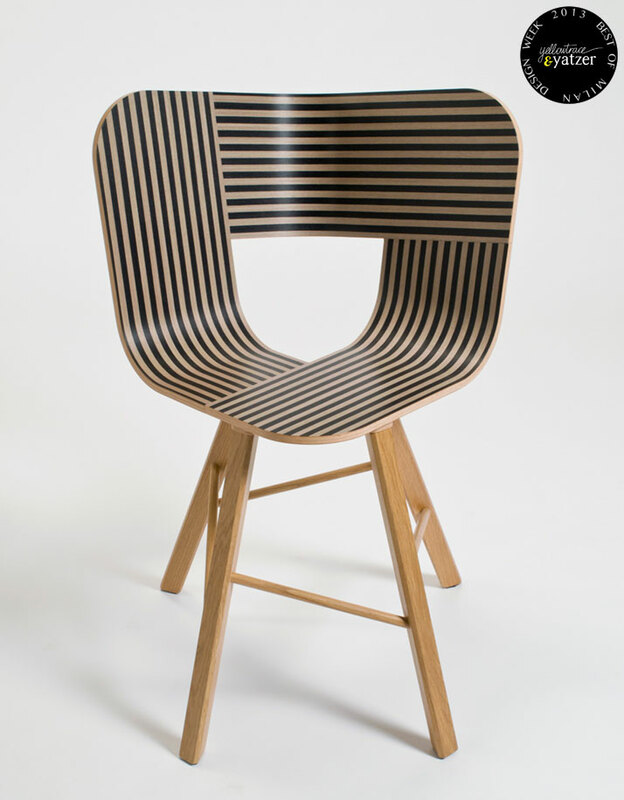 Tria Wood Chair with printed seat by Milan based studio Lorenz * Kaz for Colé. The five wooden cases of ''Origin part IV: Foster'' collection by Boaz Cohen and Sayaka Yamamoto, aka BCXSY in collaboration with Ibuki, a non-profit organization based in Sonobe, Nantan-city, Japan. They are made from Kitayama Sugi, a cedar that is typical of Kyoto and is one of the most prestigious types of wood in Japan. 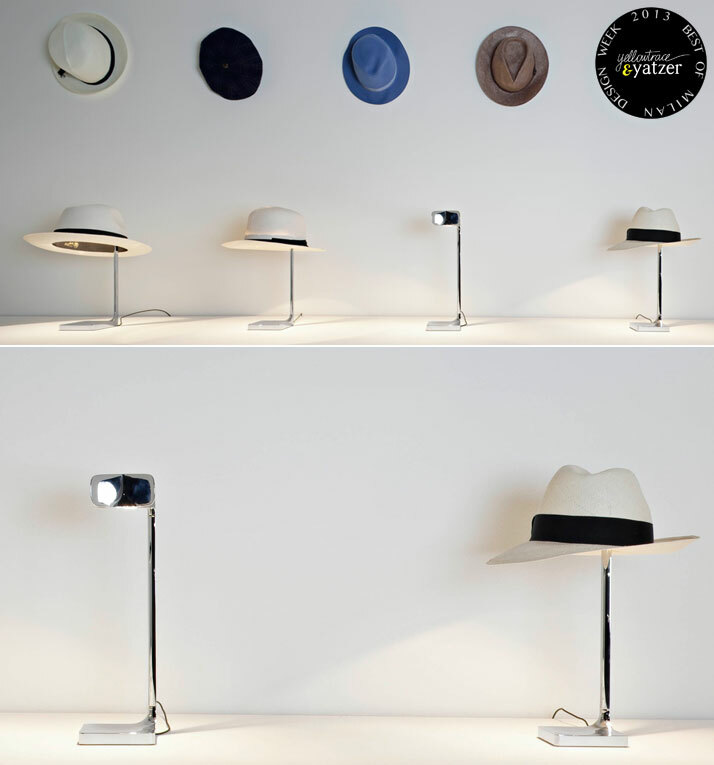 Capeau light by Philippe Starck for FLOS. 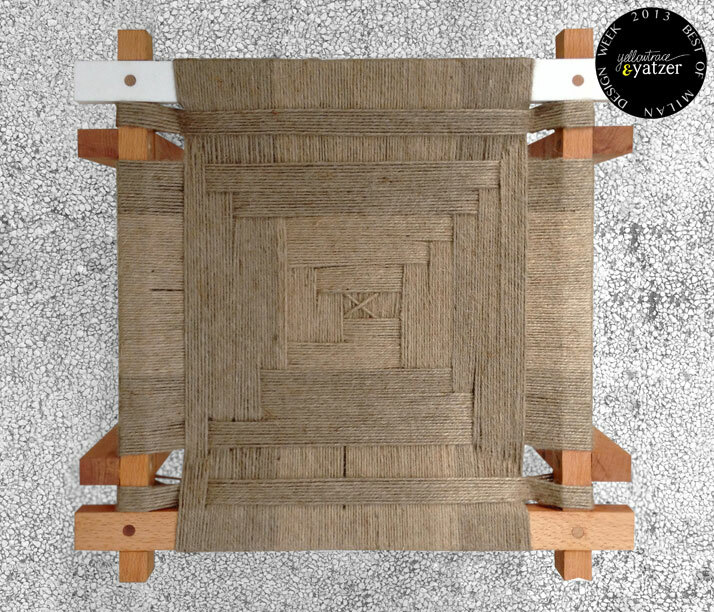 Lap stool by Constantinos Economides for MY GRANDMOTHER… exhibition by T.I.V.D (This is Very Dangerous). Fourteen Designers from all over the world went back to their own history, creating products inspired by the personalities, objects and memories of their grandparents. 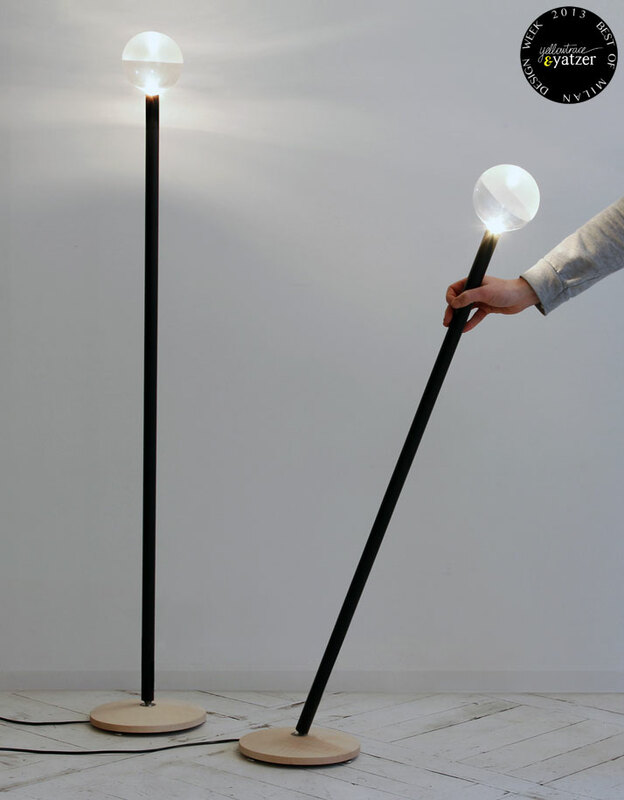 Pencil Light by Caroline Olsson. (Salone Satellite). Love Boat, from Migration Stories by Bokja, Huda Baroudi and Maria Hibri. Part of NOMADISMI exhibition at the Altai Gallery in Milan. 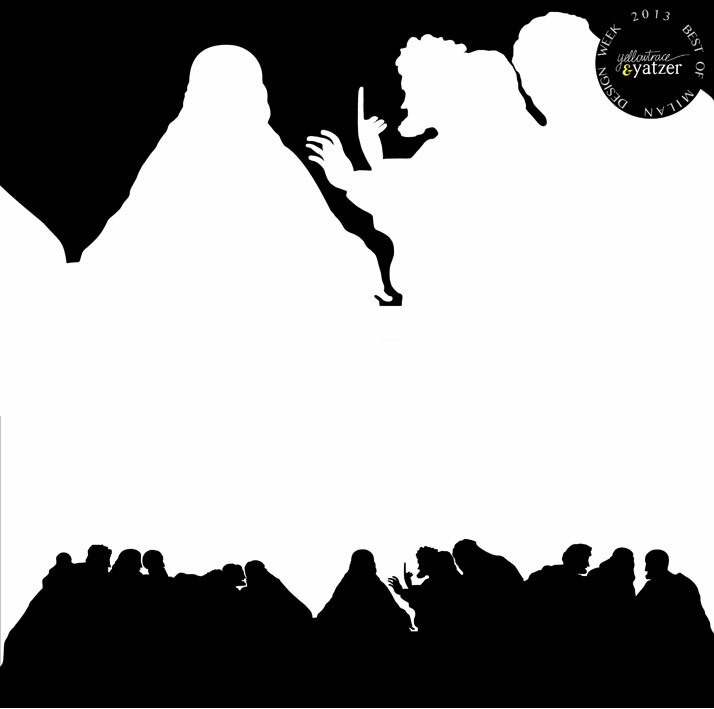 Curated by Li Edelkoort and Raffaele Carrieri. 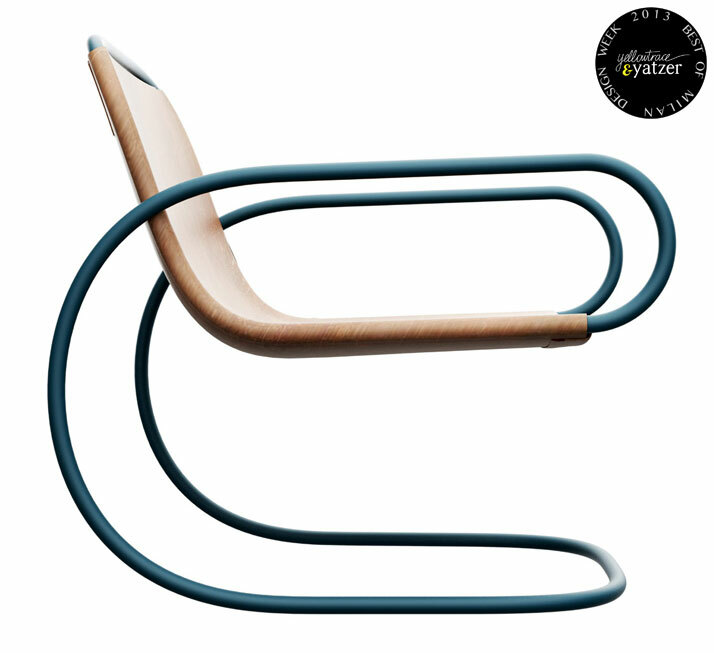 Ecco Chair by Andrea Borgogni. (Salone Satellite). 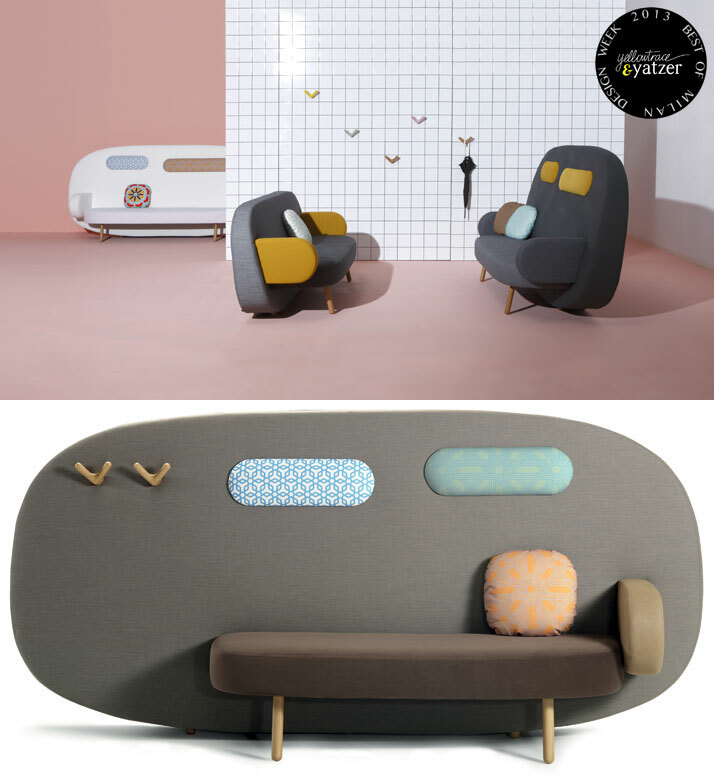 Float sofa-screen by Karim Rashid for Sancal. 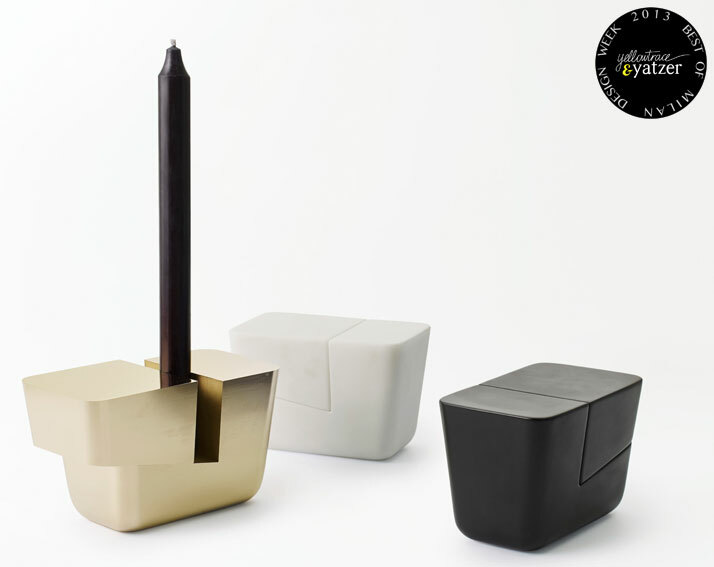 ''N=N/02 wedge of matter'' candle holder co-designed by Italian designer Luca Nichetto and Japanese studio Nendo for the NICHETTO=NENDO collection which was exhibited at Foro Buonaparte 48 in the Brera district of Milan. 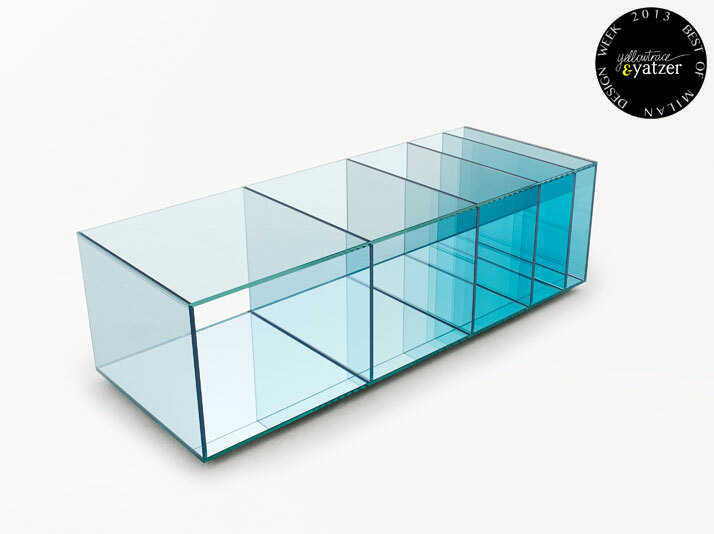 Low table from the DEEP SEA collection designed by Nendo studio for Glas Italia. Photo © Hiroshi Iwasaki. UNDERWORLD rug by Studio Job for Nodus. 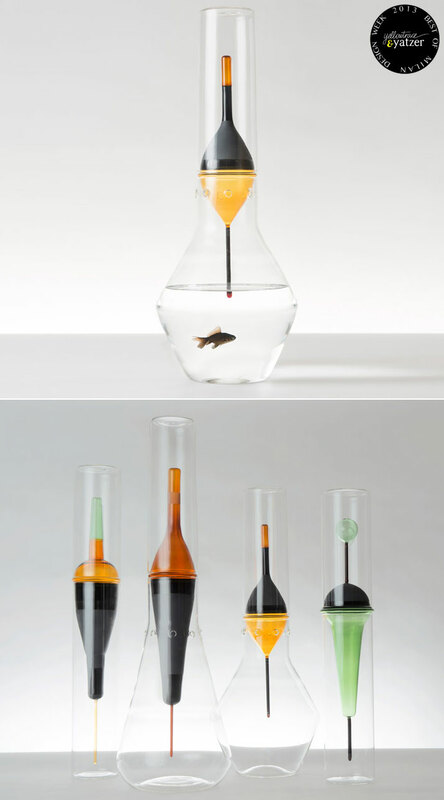 DERIVA collection of contemporary totems inspired in proportions and form by fishing floats. Designed by Cristina Celestino of Attico Design Studio. Photo by Mattia Balsamini. 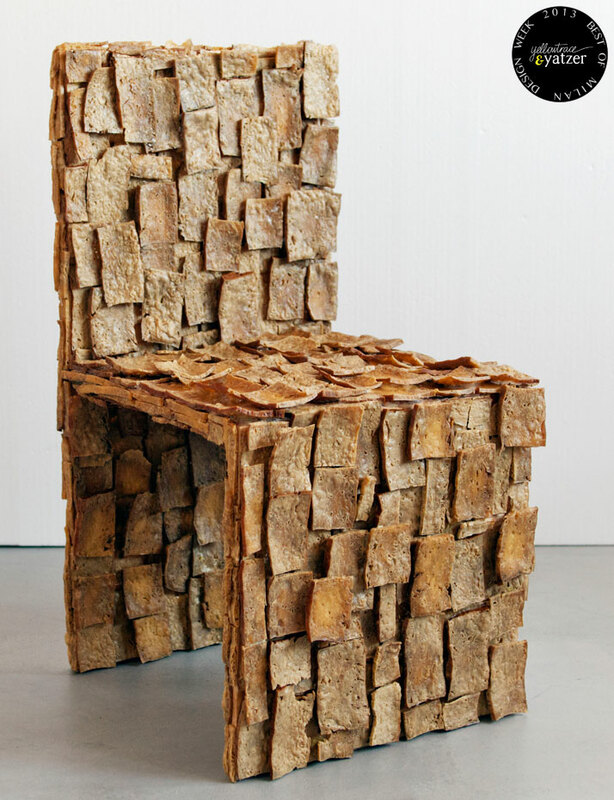 Easychair made of TOFU by Leonardo Talarico, part of the FOODMADE exhibition on Via Oslavia 3, Ventura Lambrate. (Through a dehydration process tofu can be used as a structural material!). 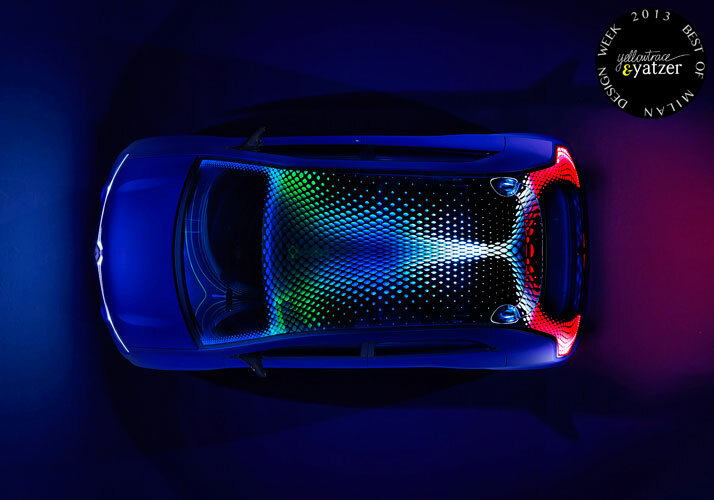 Ross Lovegrove's Twin'z concept car for Renault. The Dutch designer Siba Sahabi has made Between Two Rivers, a collection of ten vessels formed from strips of felt wound on a potter’s wheel and painted on both sides to create contrasts of color. 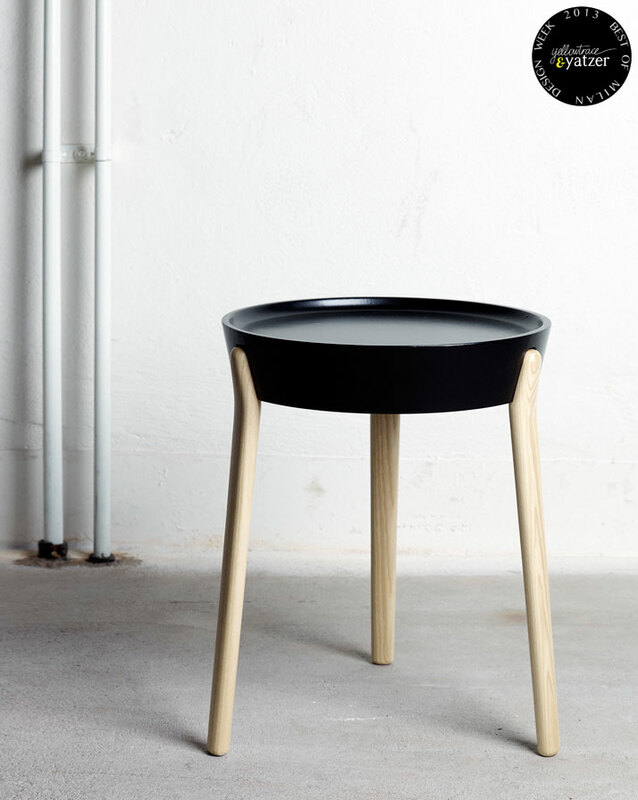 Coccola side table by Luca Nichetto for David Design. 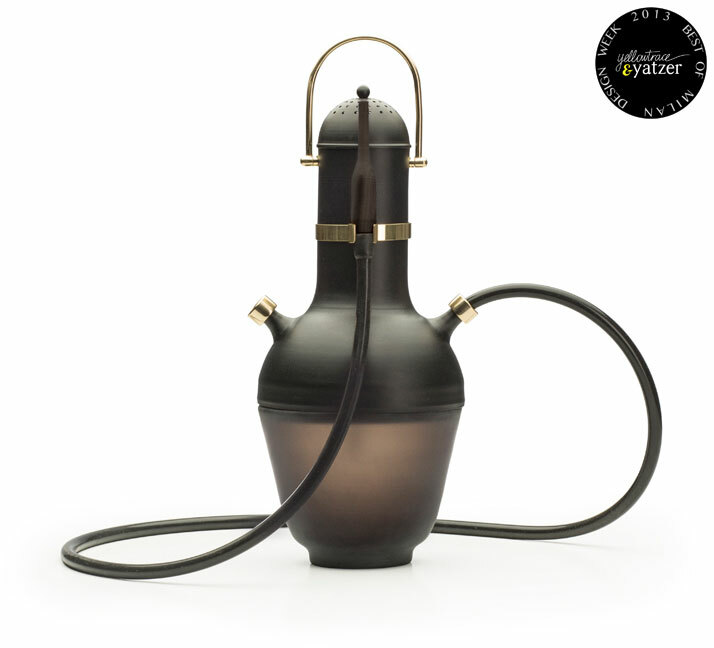 HOOKHAYON is a contemporary vision for the Turkish tradition of smoking designed by Jaime Hayon for Gaia & Gino. 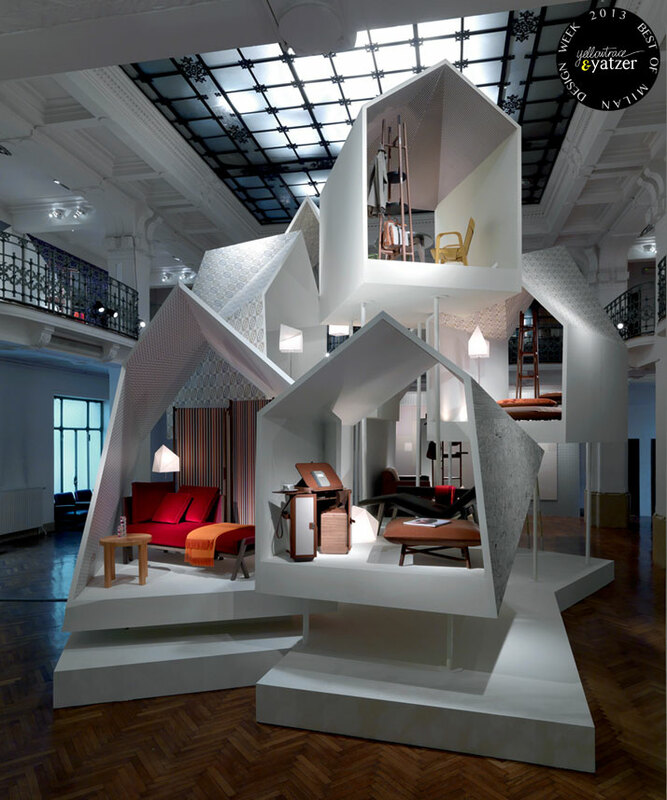 It was exhibited within the Wallpaper* Handmade 2013 exhibition which during Milan Design Week 2013 took place at Leclettico, the gallery/space of Claudio Loria. 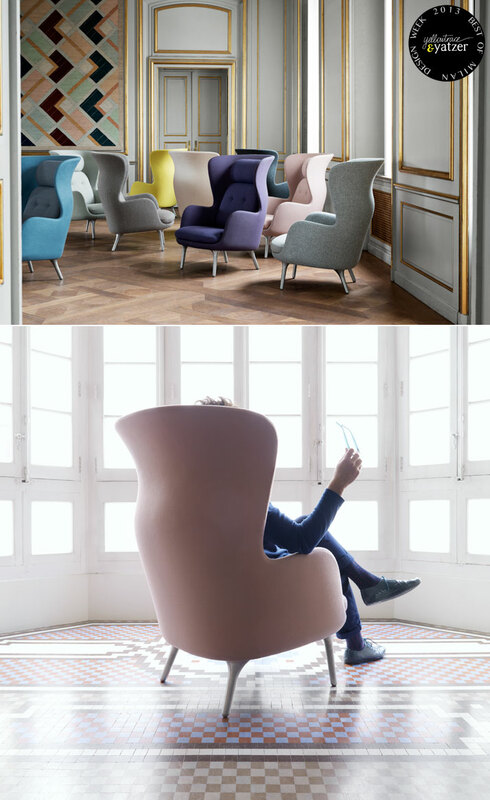 FLY Lounge Series by SPACE Copenhagen for &Tradition. Photo © Jonas Bjerre-Poulsen. 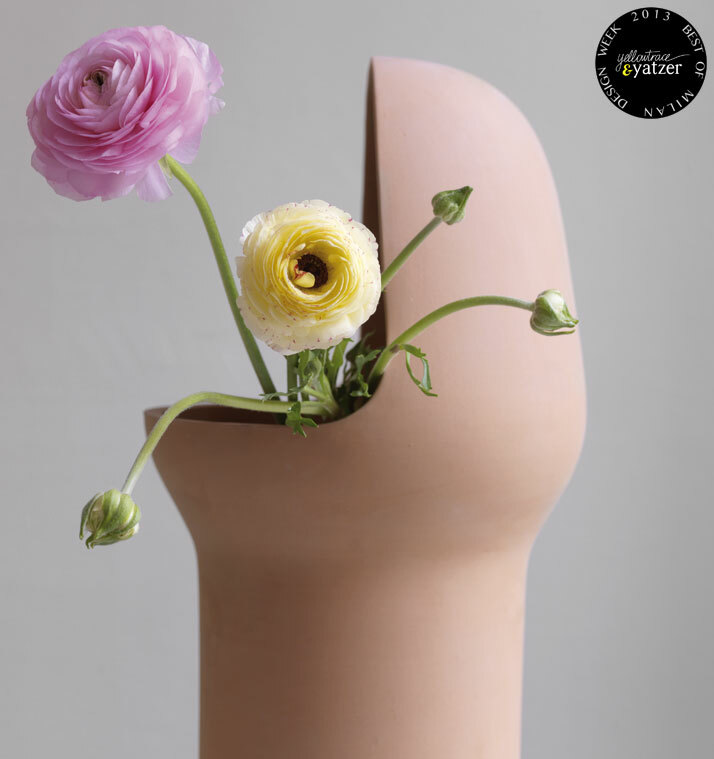 The ‘Gardenias’ Collection By Jaime Hayon For BD Barcelona Design. 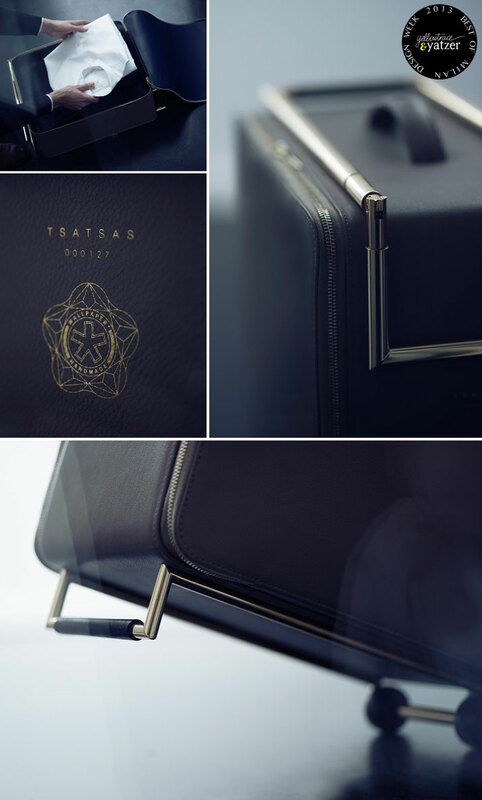 The KAGE Trolley Suitcase by TSATSAS For Wallpaper* Handmade 2013. 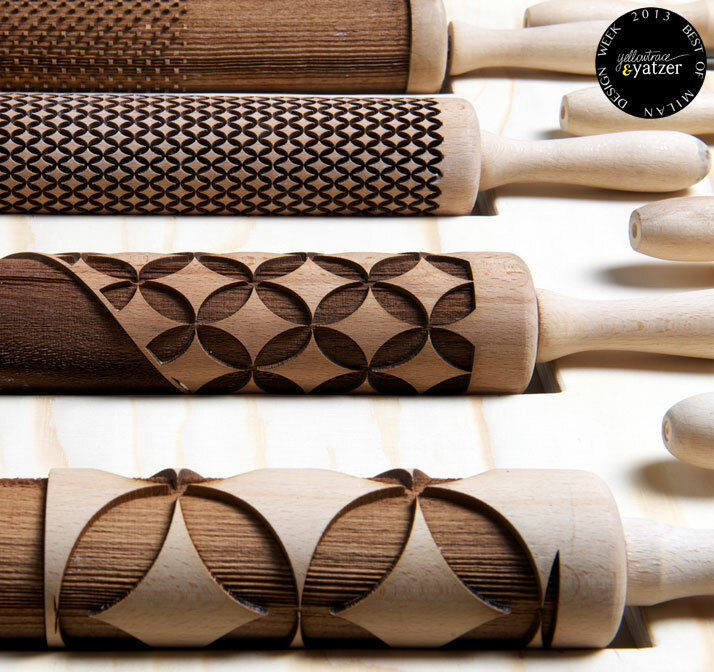 ROLLWARE: Edible Dishware by Joanne Choueiri, Giulia Cosenza, Povilas Raskevicius (students from the Masters of Interior Architecture & Retail Design (MIARD) Programme of The Piet Zwart Institute). The project was part of the ALTERED APPLIANCES' exhibition. Photo © Willem de Kooning Academy & Piet Zwart Institute. 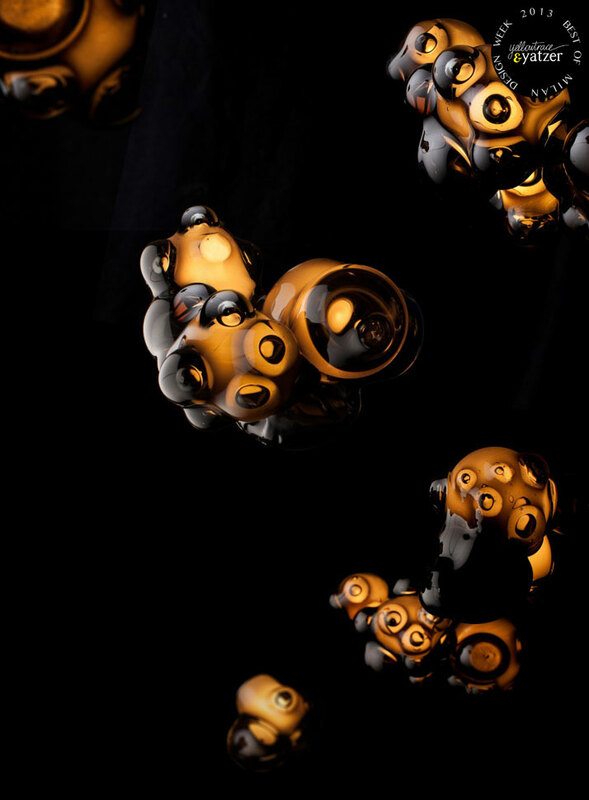 57, the latest chandelier designed by Omer Arbel for Bocci. Photo © Leo Torri, Video © Gwenael Lewis. 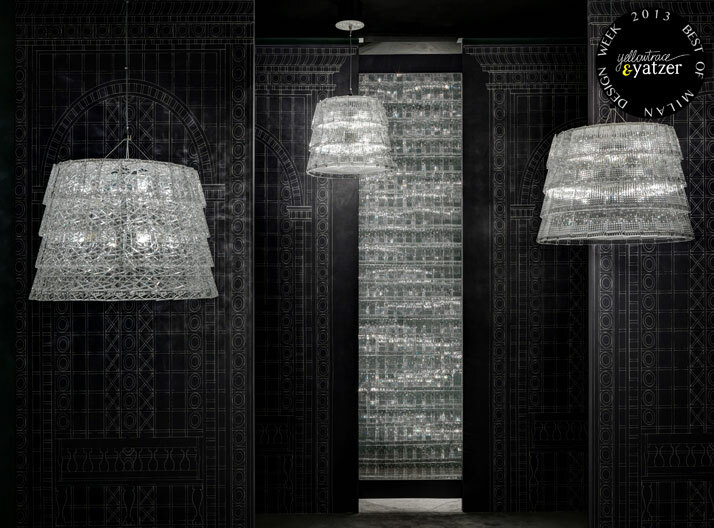 Moooi new collection presentation during Salone del Mobile 2013 at via Savona 56, Milan. 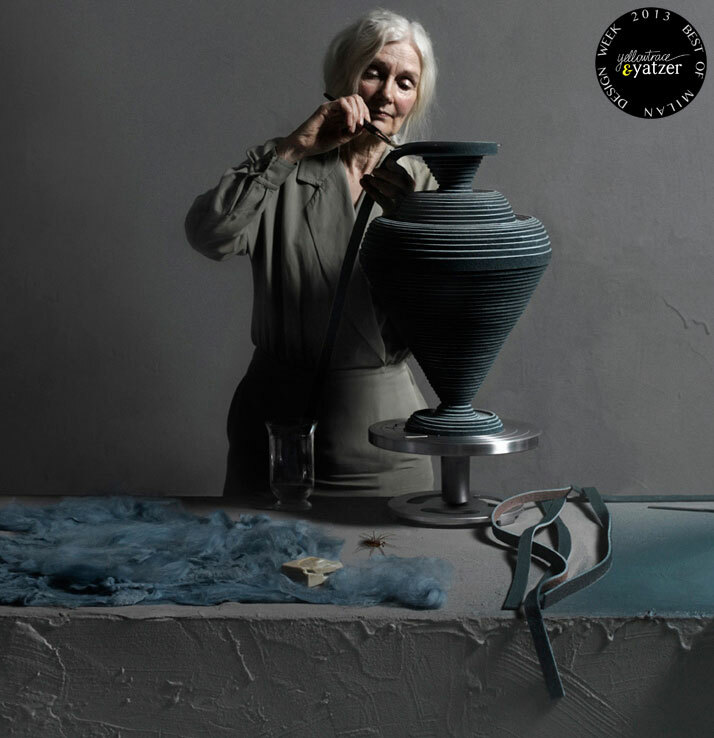 Marcel Wanders asked renowned Dutch photographer Erwin Olaf to join the Moooi 2013 presentation with a grand selection of photographs from his personal work series Grief, Fall, Keyhole and Berlin. Bucket lamp by Studio Job for Moooi. 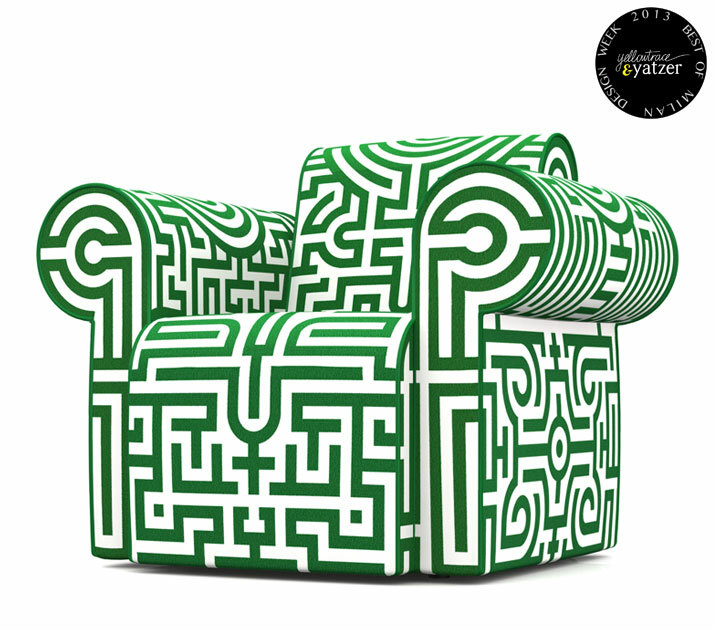 Labyrinth chair by Studio Job for Moooi. 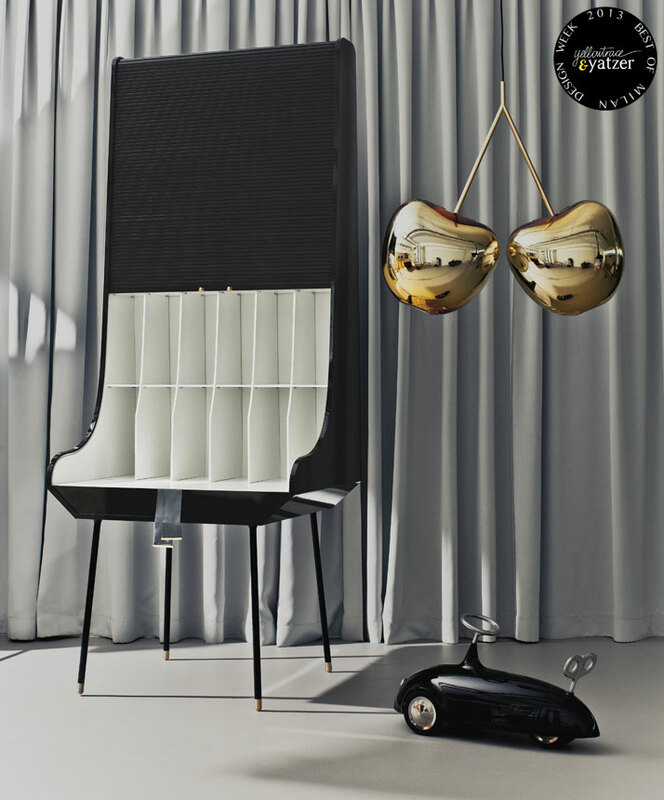 Graphic Lamp Collection by Delightfull. 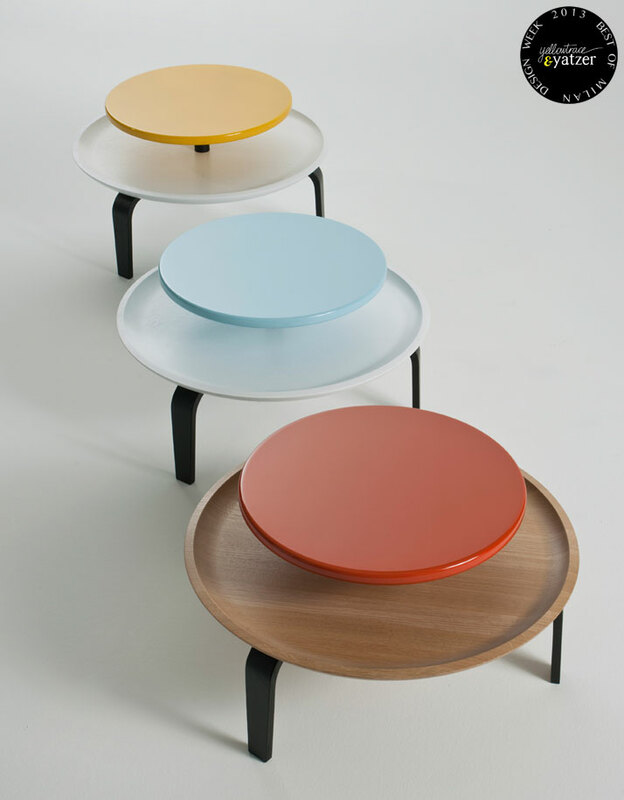 Secreto Coffee Table by Milan based studio Lorenz * Kaz for Colé. 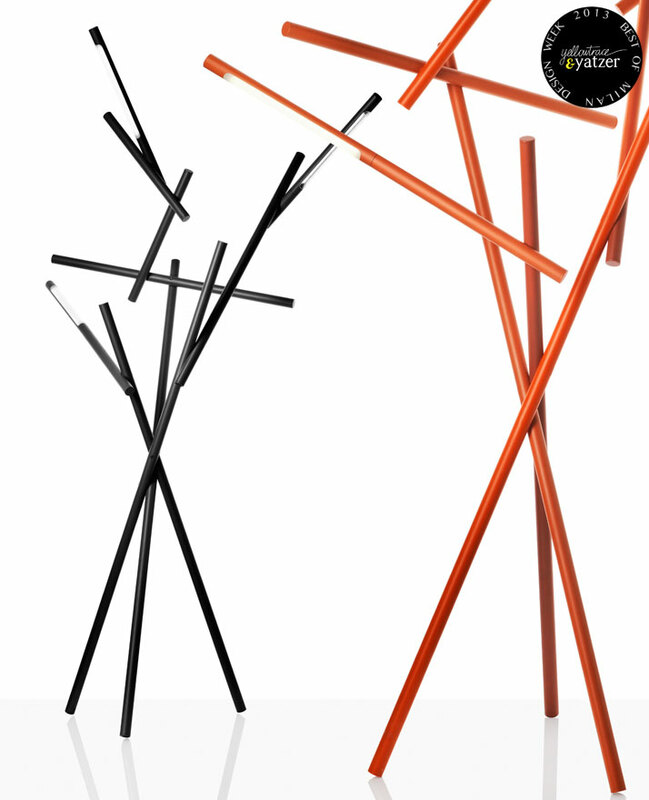 TUAREG by Ferruccio Laviani for Foscarini. 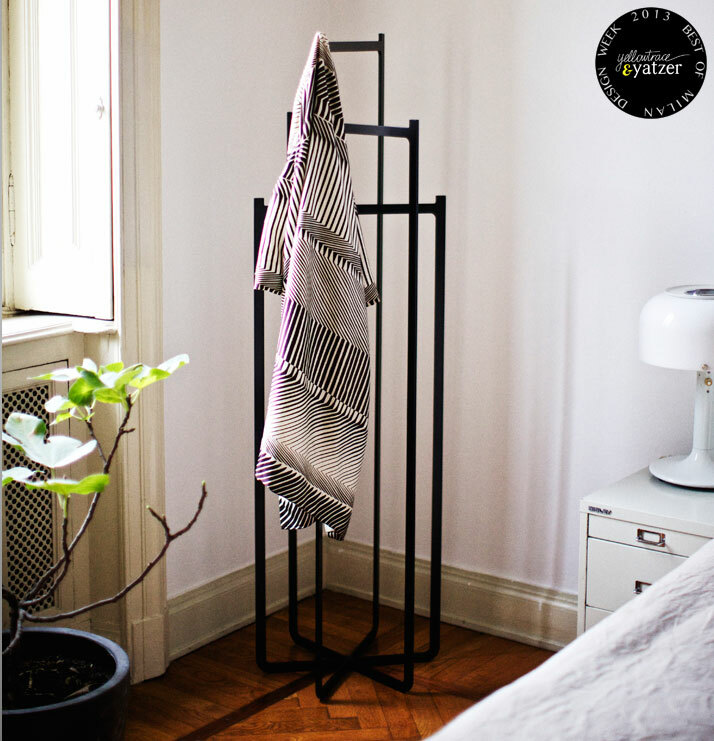 Poppins by Alessandra Baldereschi for Spazio Pontaccio. 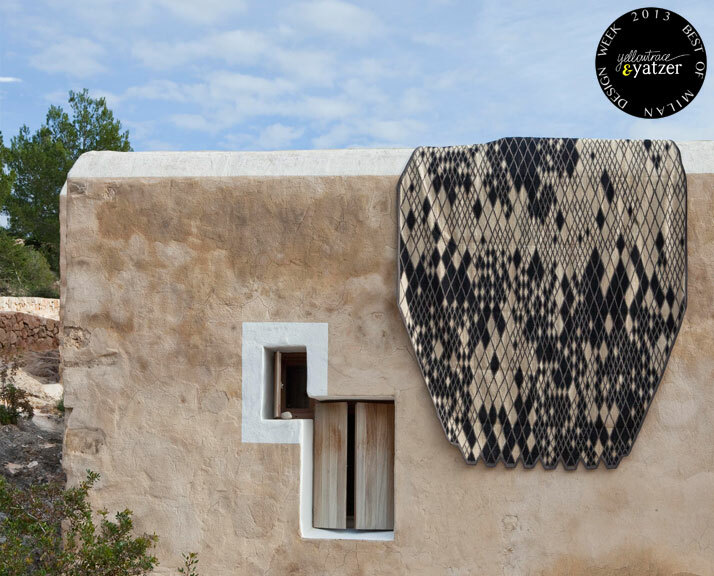 Losanges II, Design by Ronan and Erwan Bouroullec for Nanimarquina / Losanges Collection, photo © Nanimarquina. 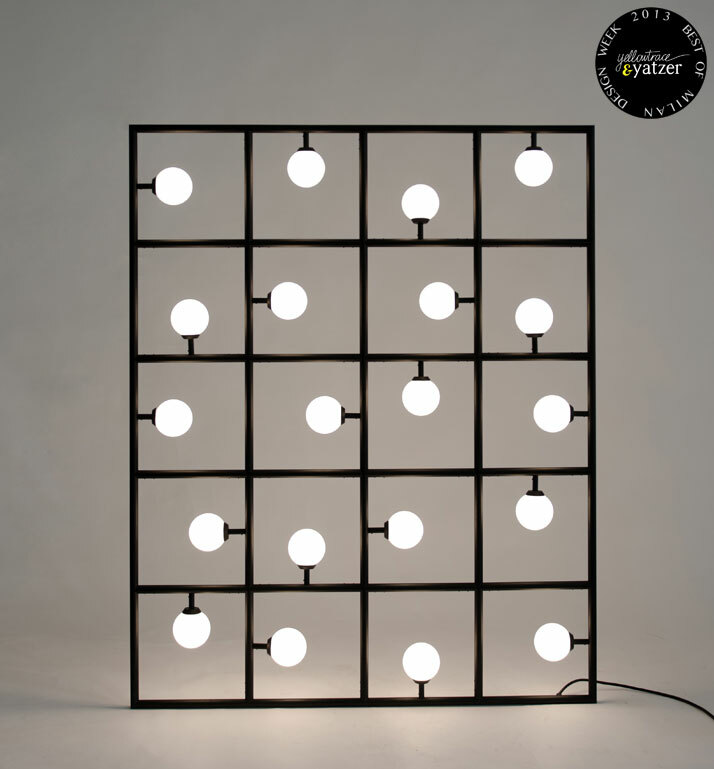 Square Floor/ Wall Lamp by Areti. 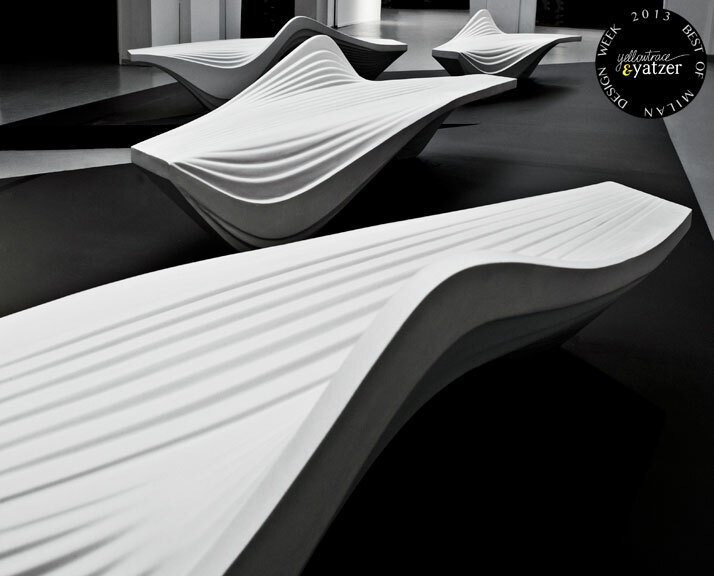 Serac bench by Zaha Hadid Architects for LAB 23. Photo © jacopo spilimbergo. The special scenography of “les Nécessaires d’Hermès”, featuring a range of furniture pieces imagined by French designer Philippe Nigro and the new HermeÌ€s collection of furnishing fabrics and wallpapers. (Circolo Filologico, Via Clerici, 10, Milan). Photo © Francois Lacour. 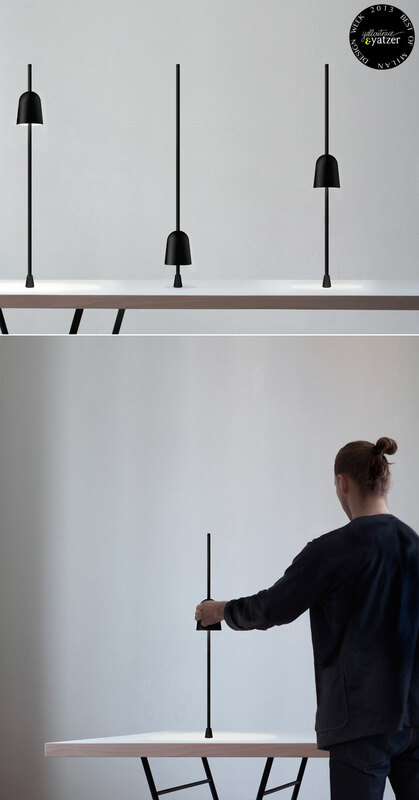 SWARM lamp by Jangir Maddadi Design Bureau. 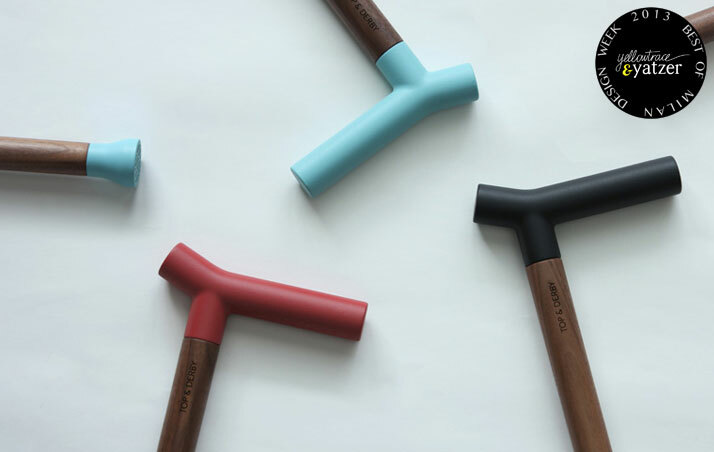 CLIP coat hanger designed by Nendo for Discipline. Photo by Paul Barbera, Courtesy of Discipline. 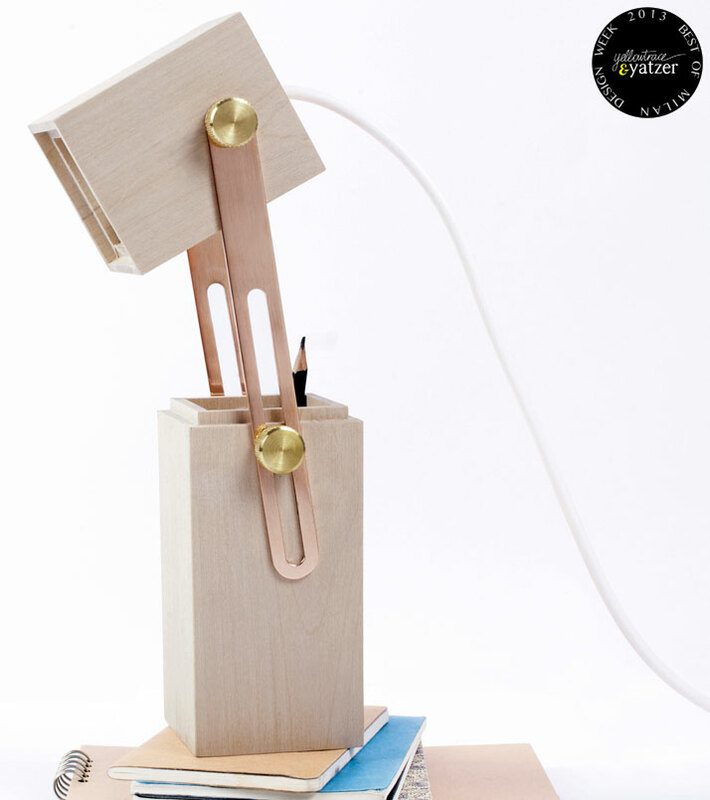 UGOL: A Minimalist Desk Lamp by Yaroslav Misonzhnikov. 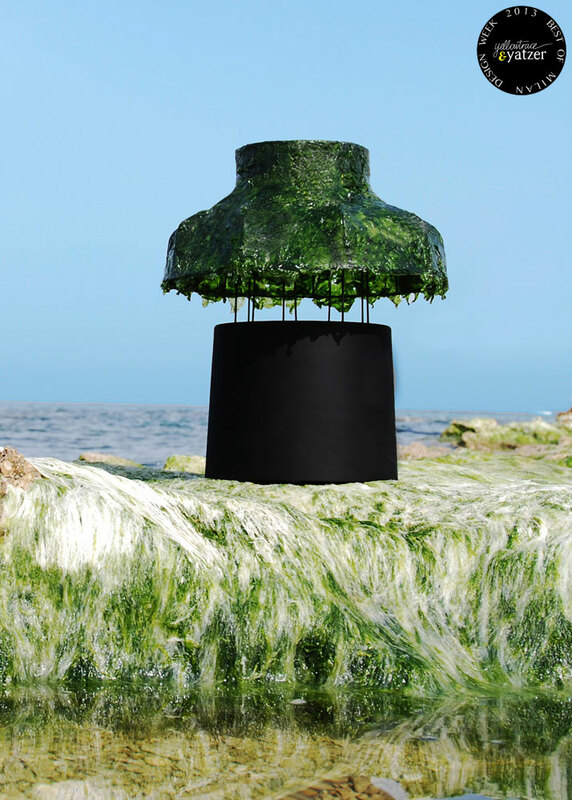 The Marine Light Made Of Seaweed by Nir Meiri. Photo © Shay Ben Efrayim, Aviram Ohad. LEXUS amazing flow by Toyo ito and Akihisa Hirata. 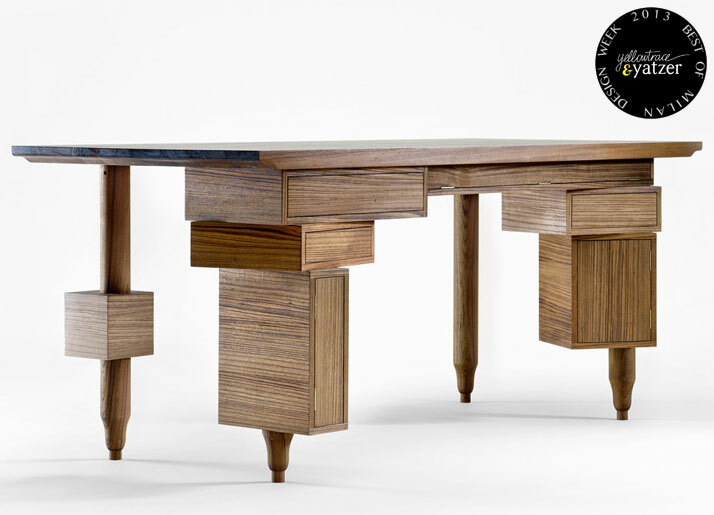 Le bureau de Paolo teak table, limited edition of 8 pieces by Sam Baron for Secondome. 'Chest of suitcases' by Maarten de Ceulaer for Nilufar. Photo © Maarten de Ceulaer. 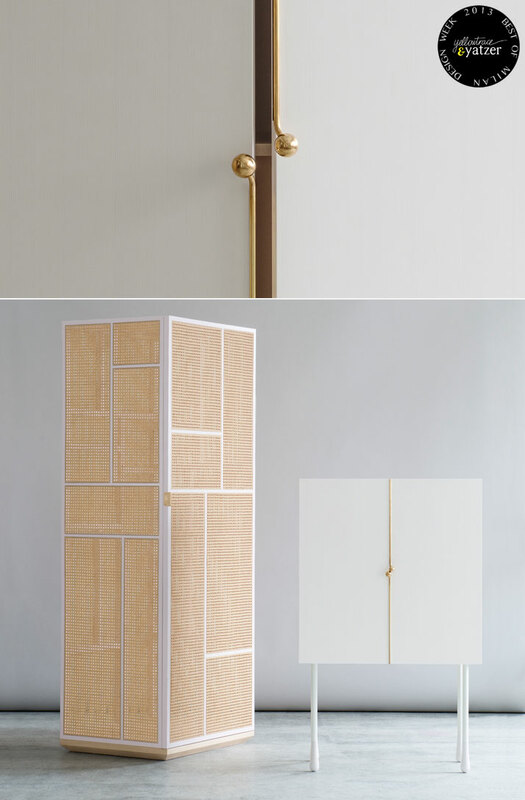 Walk-in Closet made of oak with brass details by Hosun Ching for Leclettico. 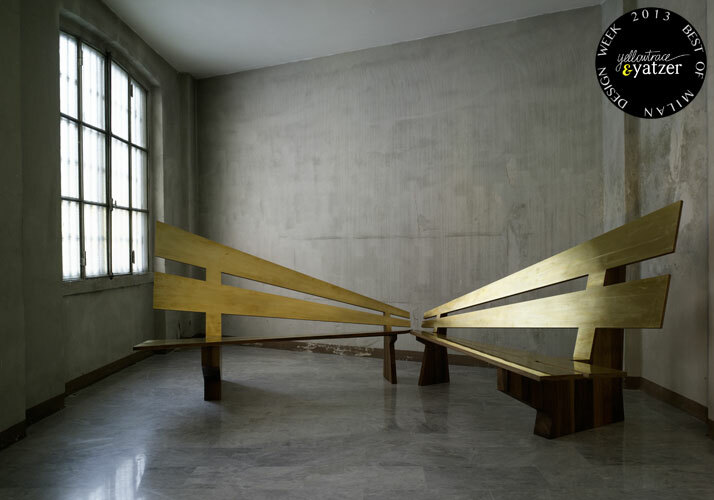 Folie bench in brass and wood by Shirley van Piere for Leclettico. 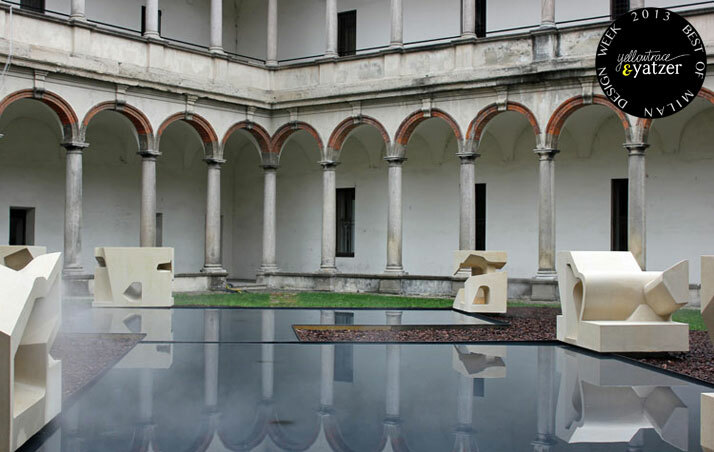 'inversion' by Steven Holl Architects at the University of Milan, Italy. Sneaker-styled walking cane by Matthew Kroeker for Top & Derby. 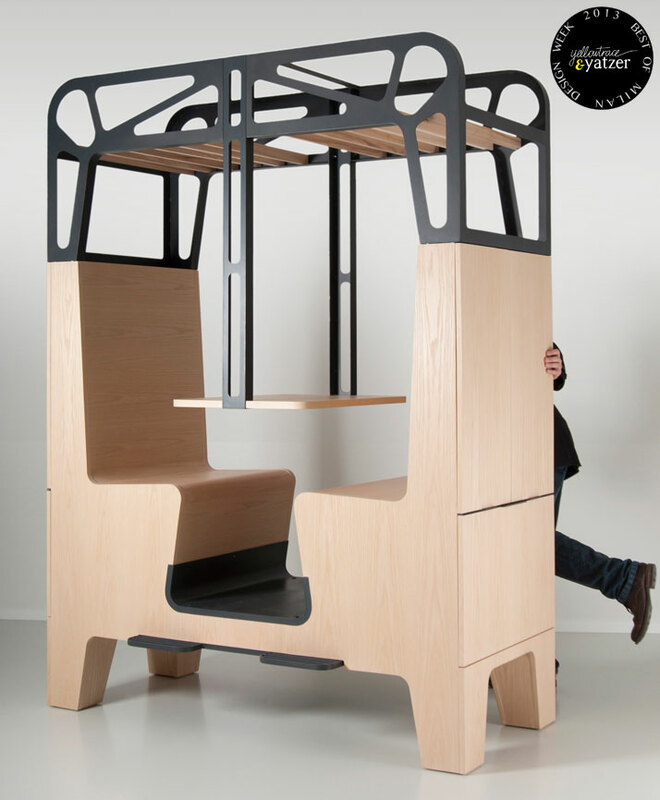 il treno - a modular dining experience - by Tjep. presented at PLUSDESIGN Gallery in Ventura Lambrate. 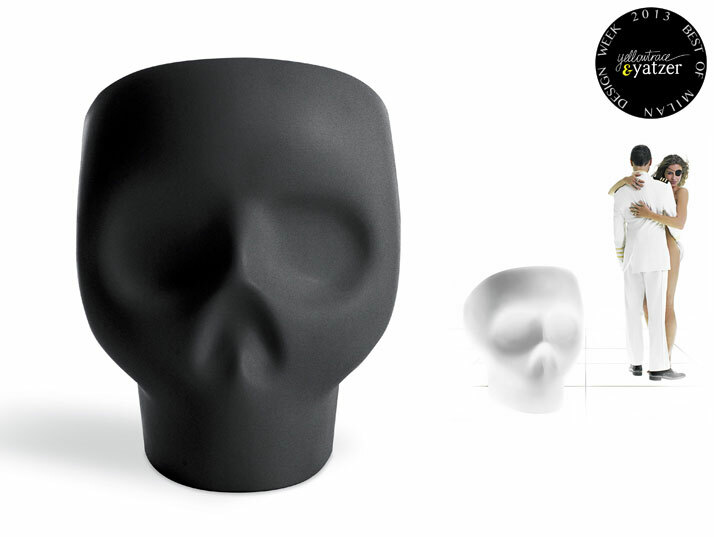 Jolly Roger armchair by Fabio novembre for Gufram. 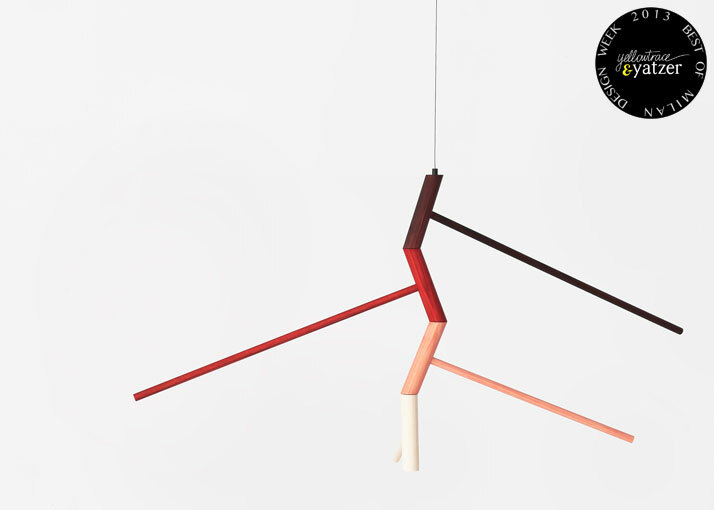 Ascent lights by Daniel Rybakken for Luceplan. Photo © Luceplan. Ro™ armchair by Jaime Hayon for Fritz Hansen. Copyright © Fritz Hansen. 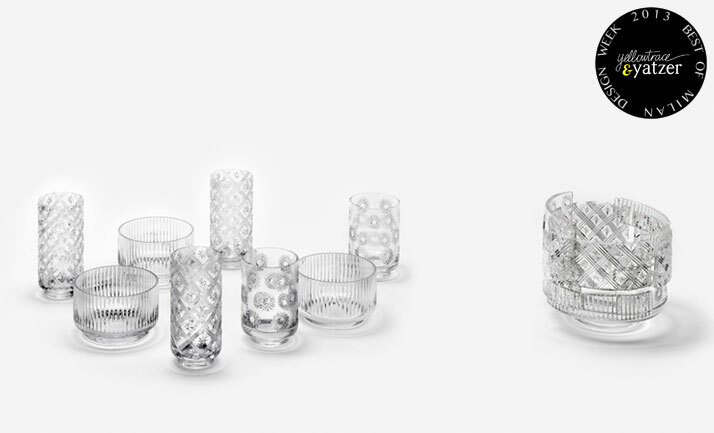 Patchwork Glass Vases by Nendo studio for Czech glassware brand Lasvit were on show at the Dilmos Gallery. 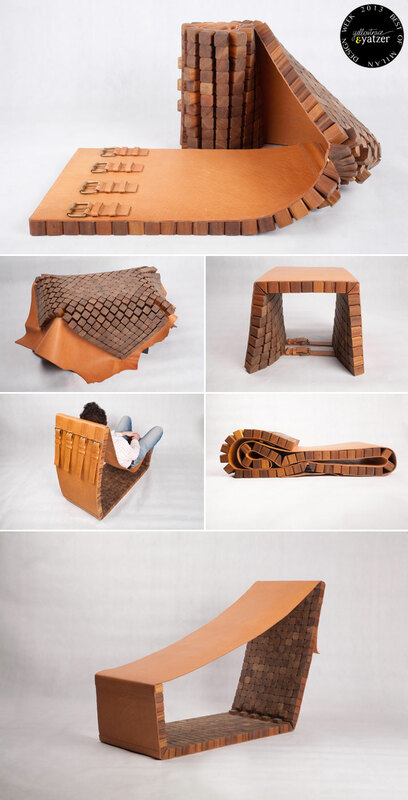 The GRAND Furniture Series Inspired By Handbag Details. 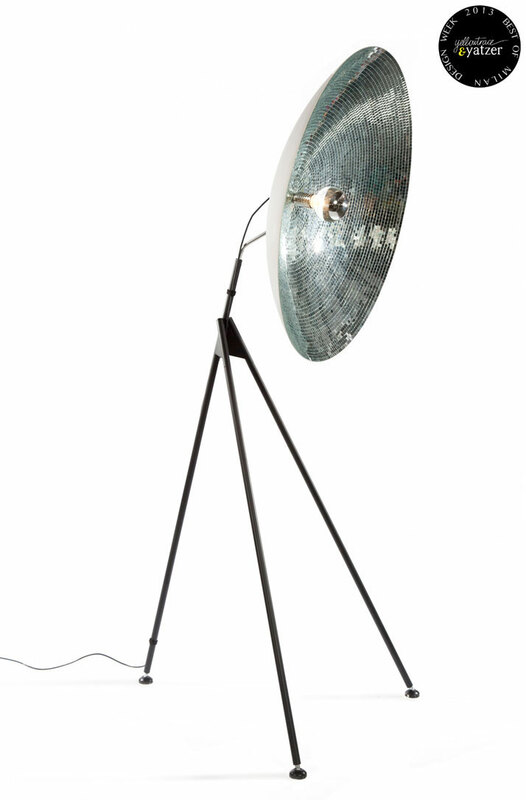 Disco Dish floor lamp by Bertjan Pot, produced by DHPH. 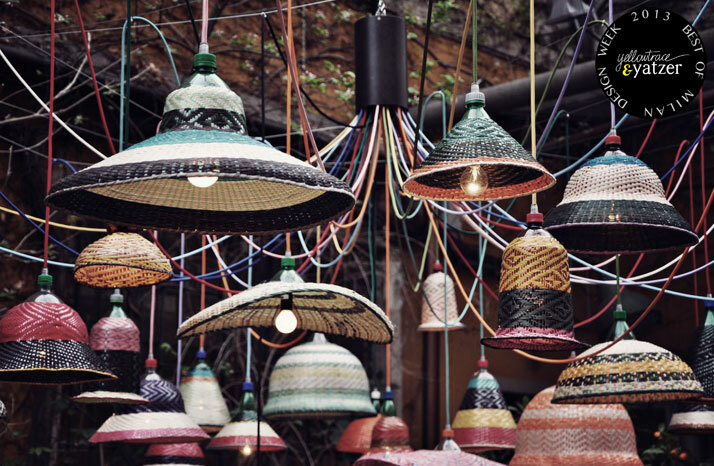 Pet lamps made of recycled plastic bottles, designed by Alvaro Catalán de Ocón. Photo by Benn Webb. 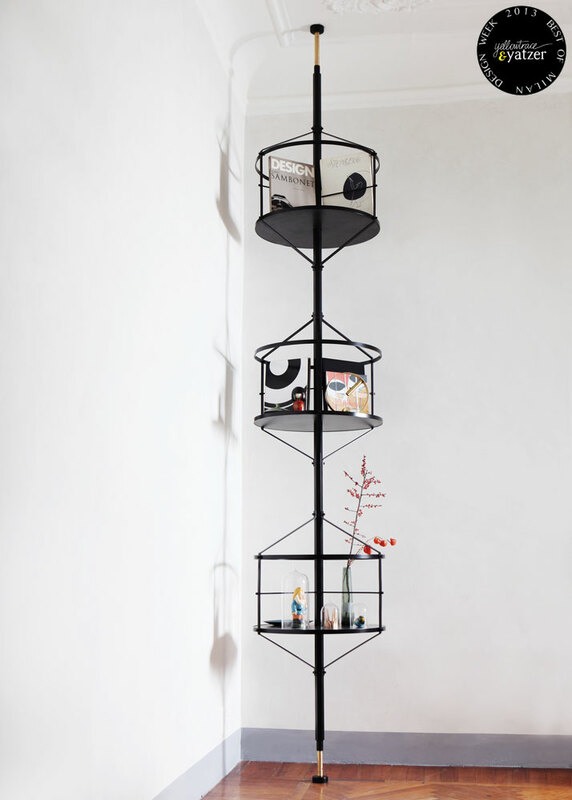 Eccentric Mobile by Jamie McLellan for Resident. RGB. 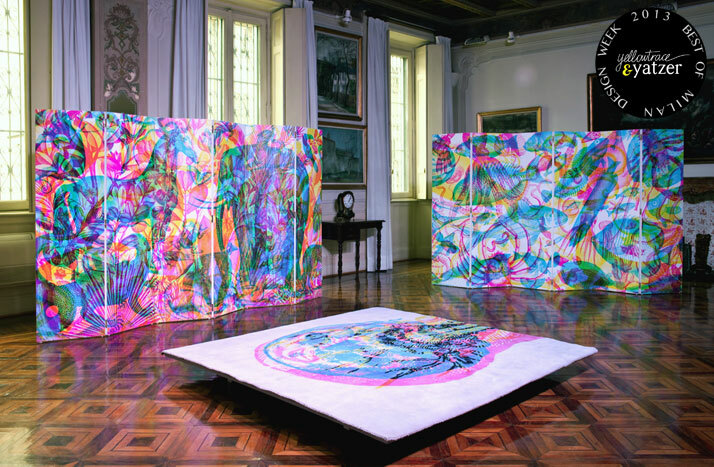 Fabulous Landscapes by Carnovsky - Francesco Rugi and Silvia Quintanilla - at Fondazione Pini in Brera, Milan. Photo © Alvise Vivenza. 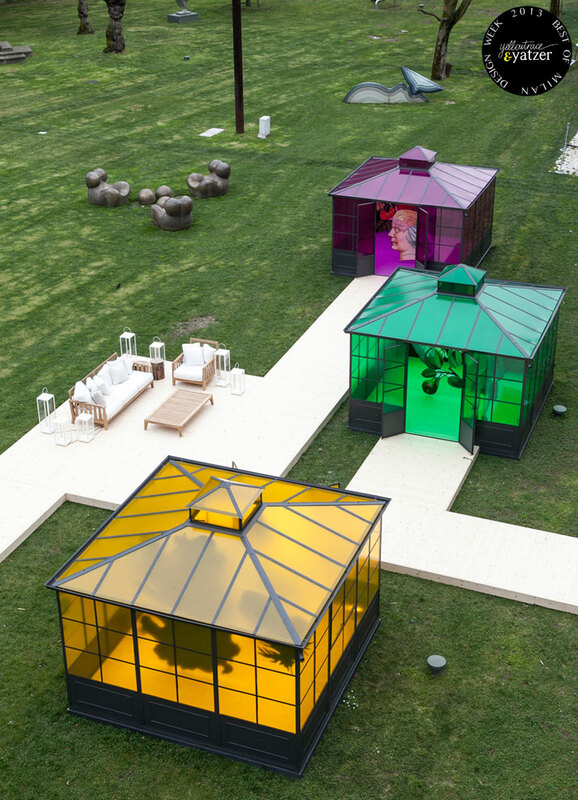 The wonderland à la Lewis Carroll of Ferruccio Laviani, crowded by Unopiù outdoor ''creatures'' in the garden of Triennale di Milano.